Latest revision on 8/30/07 to ad several images and make corrections. 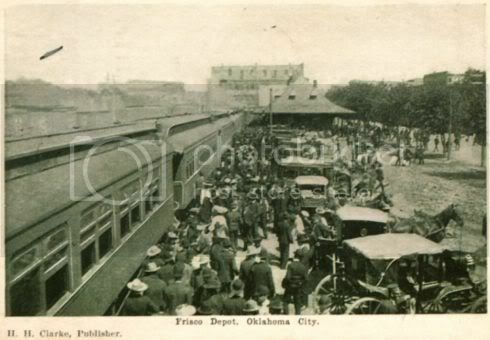 From the early Oklahoma City train days, trains, both freight and passenger, continued to flourish in Oklahoma and in Oklahoma City. Oklahoman articles, noted below, say that during the year 1917 there were as many as 10 Santa Fe railroad passenger trains through Oklahoma City daily, 16 Frisco, 10 Rock Island, eight Katy and four Fort Smith & Western," and another article said that Oklahoma City had as many as 50 passenger trains a day during the period during and just after World War II. 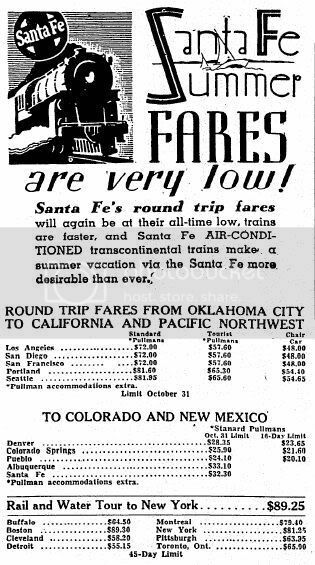 By April 1972, only a few Santa Fe passenger operations remained, and, by October 1979, the number of passenger trains in the entire state was down to zero, nada. 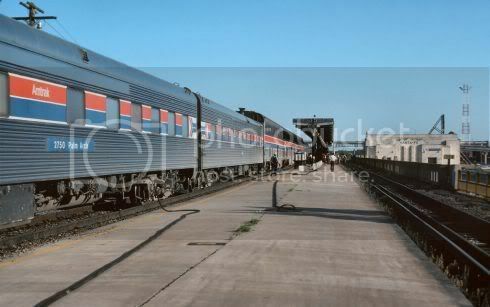 After a 20 year hiatus, a limited Amtrak presence returned to Oklahoma City in 1999. 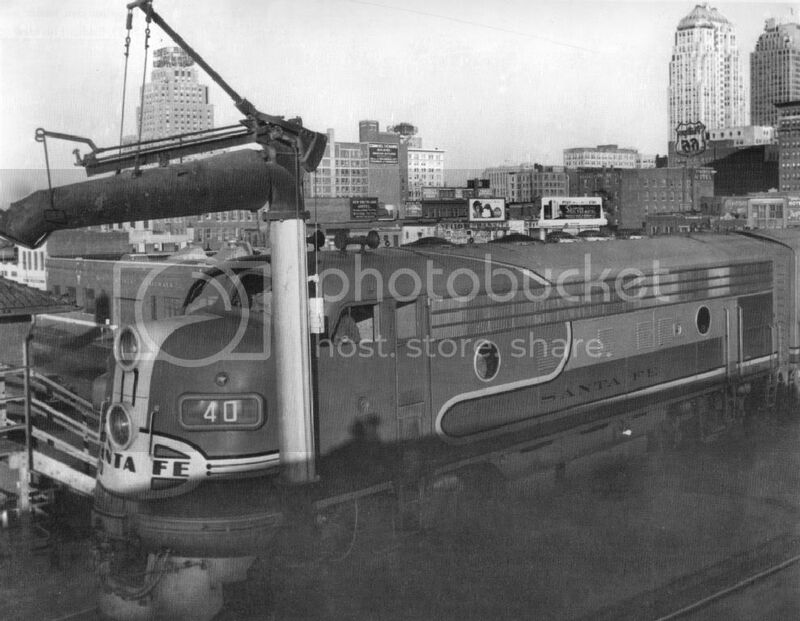 Okc Trains Part 2 tells a bit of the story and gives some links elsewhere for more. In this post, unless otherwise stated, click an image for a larger view. FIRST ... A FEW MAPS. You already know how much Doug Dawg loves his maps! 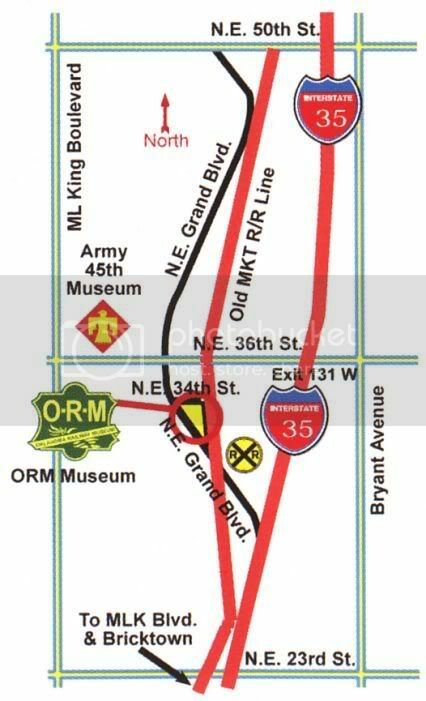 Here are a couple of railroad maps that you might enjoy (some others are in Okc Trains Part 1). 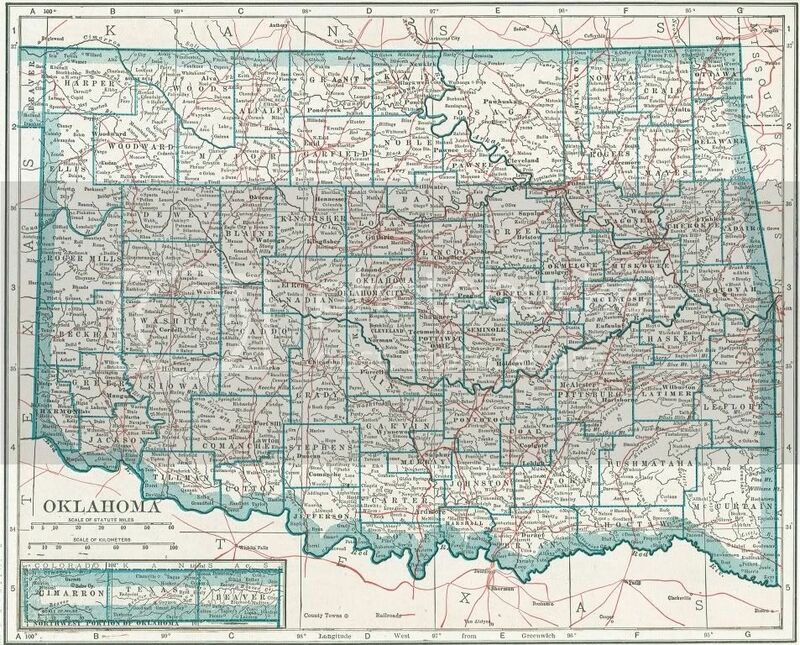 The text in the lower left corner of this map reads: "The film for this map was reproduced photographically at the same scale as original official paper map obtained from the State Corporation Commission, 1925 Edition, by the State of Oklahoma, Department of Highways, Survey Division, where both are on file. All railroads constructed after 1925 have been added hereon and all abandoned up to January 1, 1970 are so depicted, both by legend." TROUBLES IN THE 20s. Probably, there were others, but this section focuses on only 2: The Great 1923 Flood, and the Clearing of Downtown. Trouble In River City. 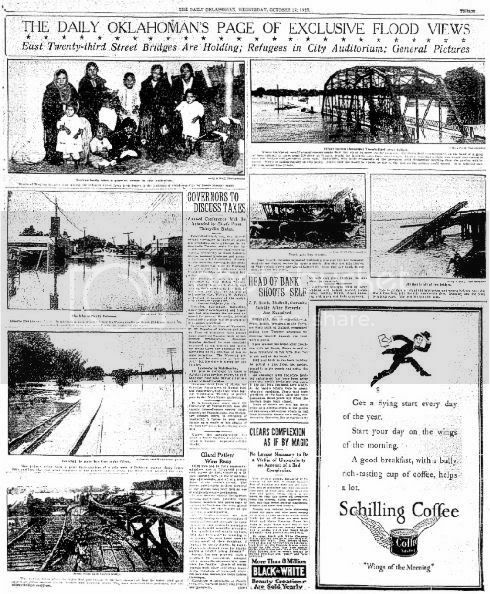 I've seen pictures before, as you probably have, of "The Great Flood" which hit Oklahoma City hard in 1923. 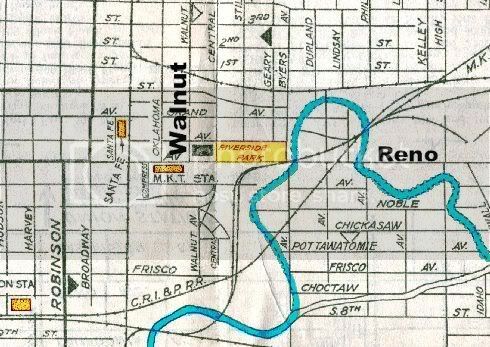 The North Canadian meandered wildly just south of downtown and, in fact, above Reno just east of the Santa Fe tracks (that's why older maps show a "Riverside Park" on the north side of Reno as shown in the cropped and colorized 1911 Planning map and Manley 1940s map below). 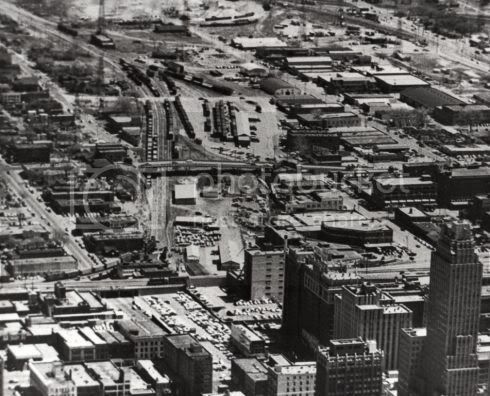 "Walnut" ("Mickey Mantle" in that area today) is on the west side of Bricktown Ballpark, to give you a better idea of what you're looking at below. So, when researching the Oklahoman's archives for this article, when I ran across a page 1 story called, "Worst Flood Since 1904...," and others in the same vein and time sequence, I thought I'd found what I was looking for. The headlines speak for themselves - click on an image for a larger view. I thought that I was done! But ... NO! Some things just didn't match up, such as the National Weather Service listing the North Canadian flood of October 13-16, 1923 (and not May and June, 1923), as being among the state’s top weather events of the 20th century ... not in the top 16 but in the "others" category. 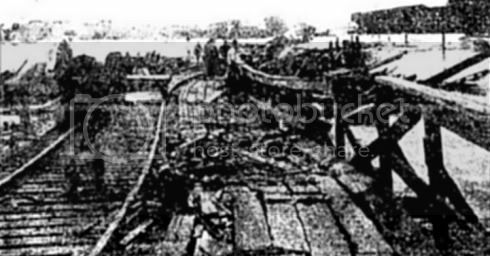 The above article calls this the "East Frisco Bridge"
Then, looking more closely in a couple of my books, it appeared that text and images in the venerable Vanished Spendor II and Griffith's Oklahoma City: Statehood To 1930 were being mixed and matched inaccurately with the respective 1923 floods – that is, unless each reference was referring to both 1923 floods in a collective way. For example, Griffith's Chapter 8, "The Great Flood," includes images from both the May-June and October floods in the same chapter and context. 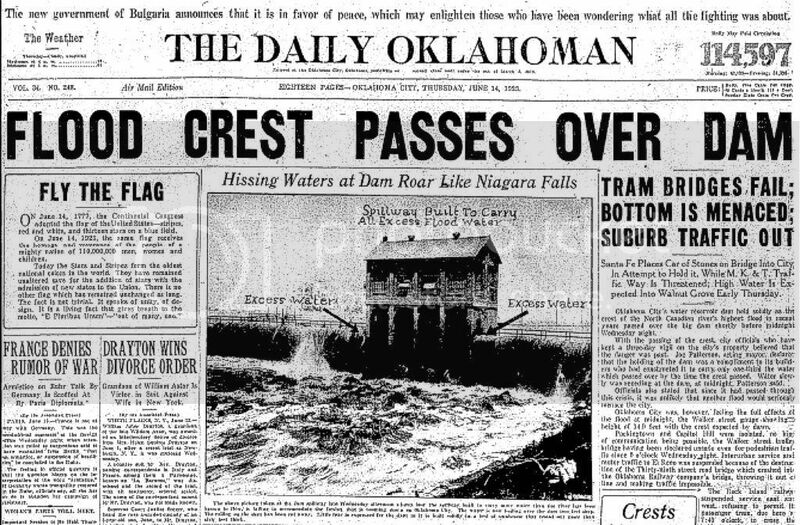 Vanished Splendor II does the same in it's Images 312-315 – the picture of Overholser Dam overflowing, below, has hard-to-read but nonetheless legible handwritten text written on the image, "June 1923" (observable in the same pic at Griffith, page 110 – it's the same pic as 313 in Vanished Splendor II although the handwritten text at the very bottom showing a date does not appear in #313 as it does in Griffith's book. So, who has got it right? The writer of "handwritten text" on images, Griffith and/or Vanished Splendor II, the National Weather Service, who? 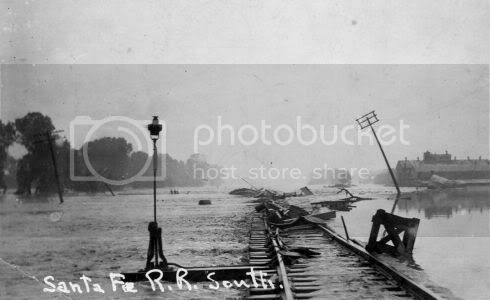 I'll go with the National Weather Service, just as a guess, establishing October 1923 as the holder of "The Great Flood" title. Later that same morning Mayor O.A. Cargill issued a special proclamation to the Citizens of Oklahoma City stating that "for the protection of property within the flood district, police and soldiers on duty have been ordered to shoot to kill any person found looting and breaking into any abandoned house or store building." That's a dandy quote but I was not able to locate it in searching the Oklahoman's archives as to either of the 1923 floods. The points are (1) it's really hard to know whether "The Great Flood" was in May-June or October 1923, and (2) unless handwriting is on an image or some other verifiable source gives a date, the images which follow are from either one flood or the other, and I'm not always sure which to match with which. Either way, though, damage to both local and interstate rail was serious, just as was true for the whole region in the North Canadian flood plane below Overholser Dam. With those qualifications, here are some pics. The 1st pic is from Griffith's book since it shows a part of the handwritten date. 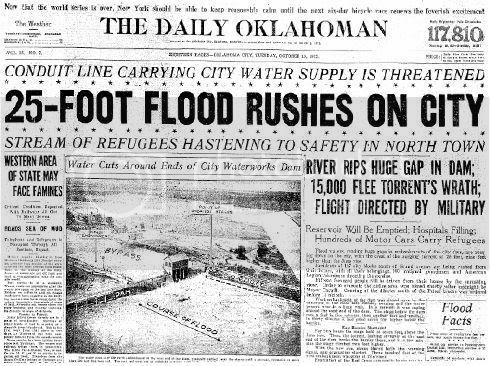 A more famous October flood, and surely one that had an enormous social impact, was the October 13-16, 1923 North Canadian River flood that caused great devastation in Oklahoma City. 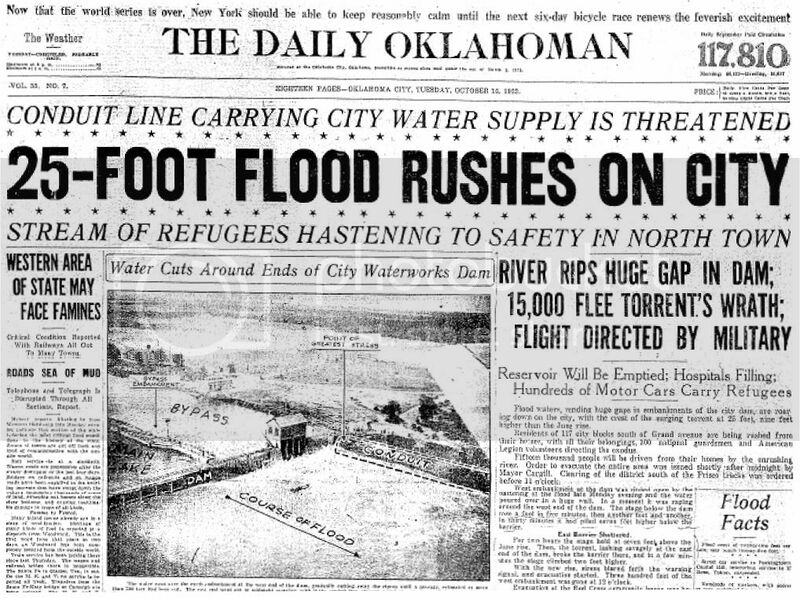 The floodwaters, produced by copious rains in the river’s northwestern Oklahoma watershed, breached the earthen embankments of the Lake Overholser Dam and caused $15 million (1923 prices) worth of damage in the capitol city. Virtually isolated by the greatest flood in its history, Oklahoma City tonight sheltered its little army of refugees and waited for the muddy, turbulent expanse of the North Canadian river to recede and reveal the damage it has wrought. 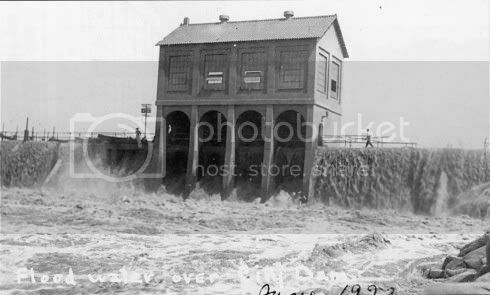 Many more photographic images of one or the other "Great Floods" will be in the Okc Trolleys post, to be written after this one is done since that's what I have the most pictures of. A Downtown Divided. 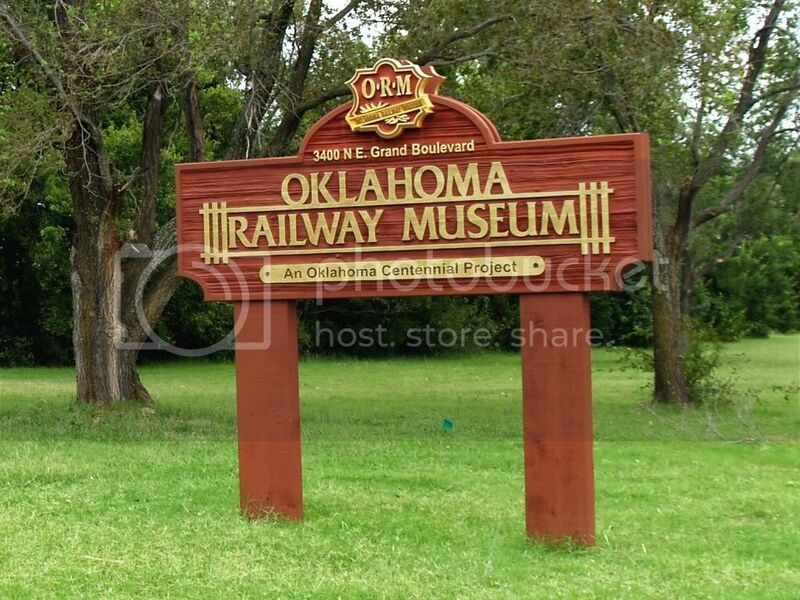 While attraction of major rail carriers was a goal pursued hotly by early day Oklahoma City pioneers like C.G. 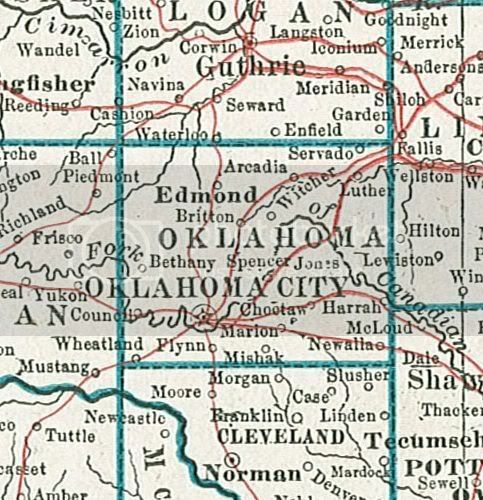 Jones and Henry Overholser, and while success in that regard was attained by persuading the Frisco and Rock Island lines to become focused upon Oklahoma City, it was not without the practical cost of making pedestrian and vehicular traffic most difficult and, given the volume of rail traffic in the early years, impossible at times. 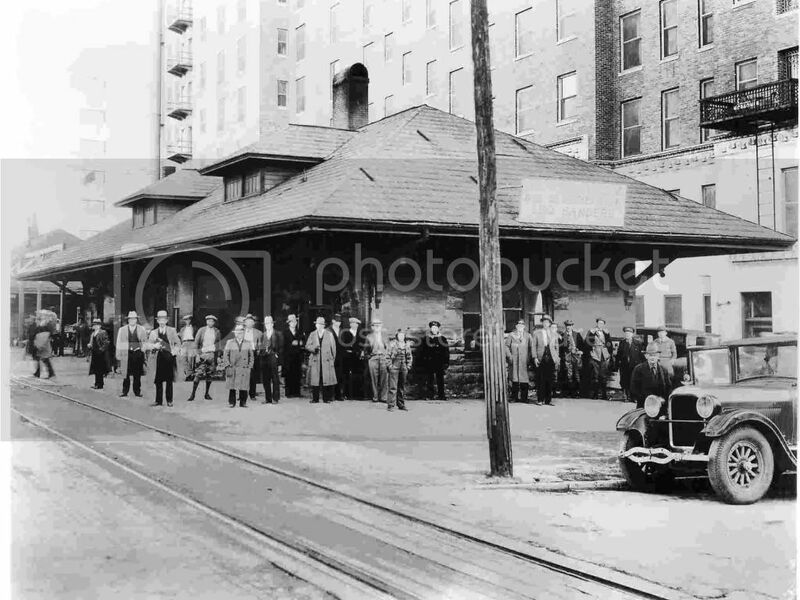 All downtown intersections of street and rail crossings were "grade crossings" and, of course, trains had the right of way. 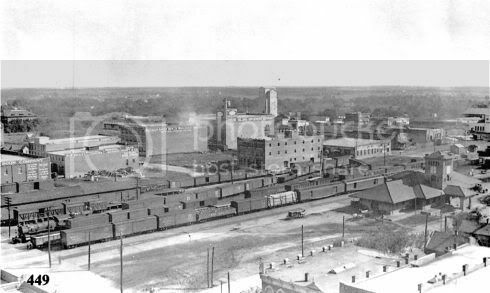 To move east and west to/from "downtown" and what is now "Bricktown," crossing the Santa Fe tracks was required. 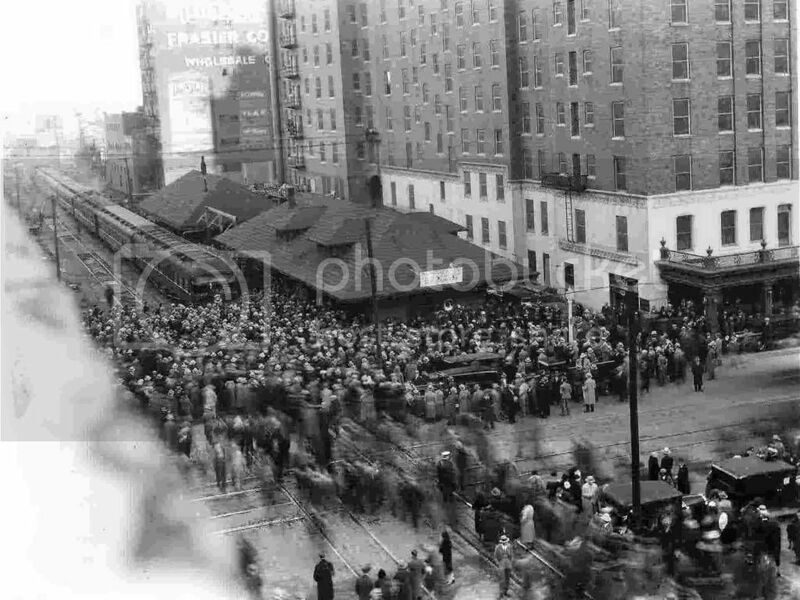 To move north and south in downtown between 1st Street (Park Avenue) and 2nd Street (Robert S. Kerr), crossing the Frisco and Rock Island tracks had to happen. This all comes home visually by looking at another map, this one being a cropped and colorized look at a 1922 Sanborn Map. Co. image of a slice of the central business district, below. 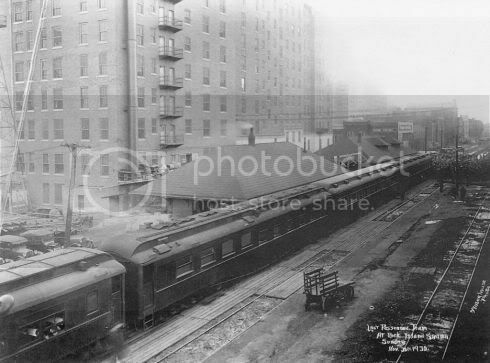 I've highlighted downtown rail – notice that very often it wasn't just crossing "a" track, it was crossing a "yard" of track. The downtown passenger terminals are also marked. 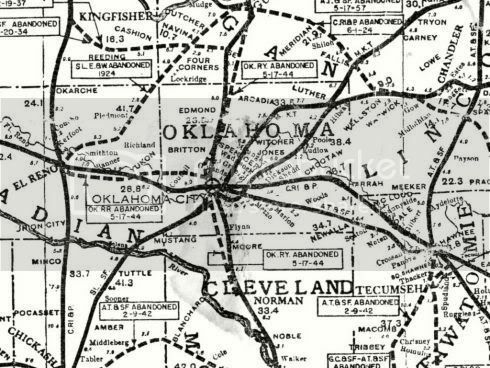 In 1897 Oklahoma City looked like any other rural village of a few thousand people. The streets were unpaved and muddy much of the time. 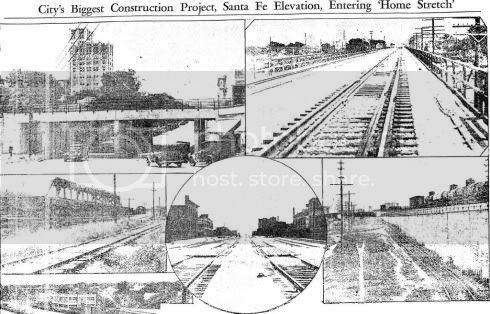 The central business district, confined to Grand and Main streets between the Santa Fe tracks and Robinson, had the rough appearance of a frontier town with wooden sidewalks and false fronts. 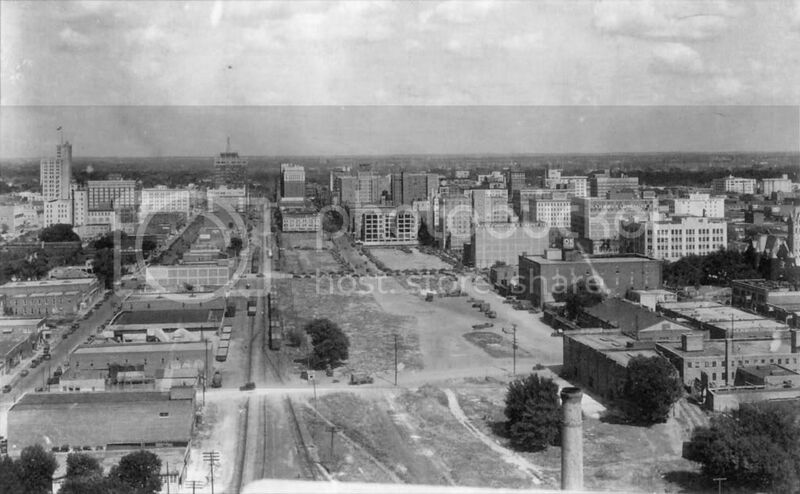 * * * Despite this outward appearance, Oklahoma City was poised at a turning point in its brief history. In 1897 the young town still was locked in a stagnating five-year economic depression; by the end of 1898, the town again would be alive with the sounds of hammers and saws. There were several reasons for this transformation. One was an agricultural upturn after 1898; another was the arrival of a new generation of talented and energetic men. 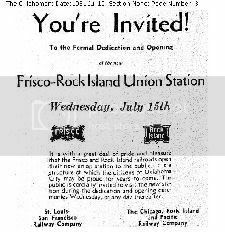 The real catalyst for the phoenix-like economic resurgence, however, proved to be the completion of the St. Louis and Oklahoma City Railroad [to become a part of the St. Louis & San Francisco Railroad]. 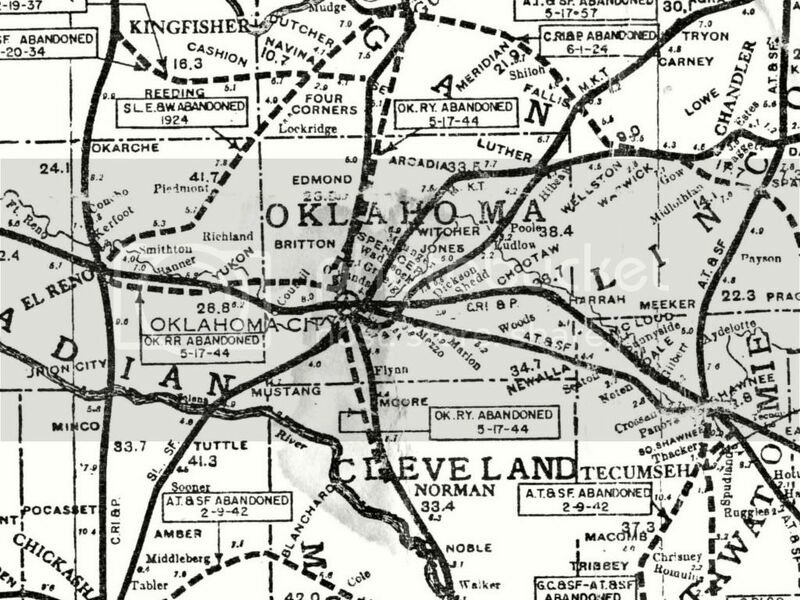 Mr. Blackburn quotes an 1898 Oklahoma City resident as saying (when recalling the importance of the Frisco), "Most of all there was a new psychology, or shall I say the returning of the old psychology. The old hope, the old expectation, and the old spirit came back, and with redoubled strength." Mr. Blackburn then says, "As a result of this rekindled fire, Oklahoma City entered an economic boom that tripled the population in just three years." 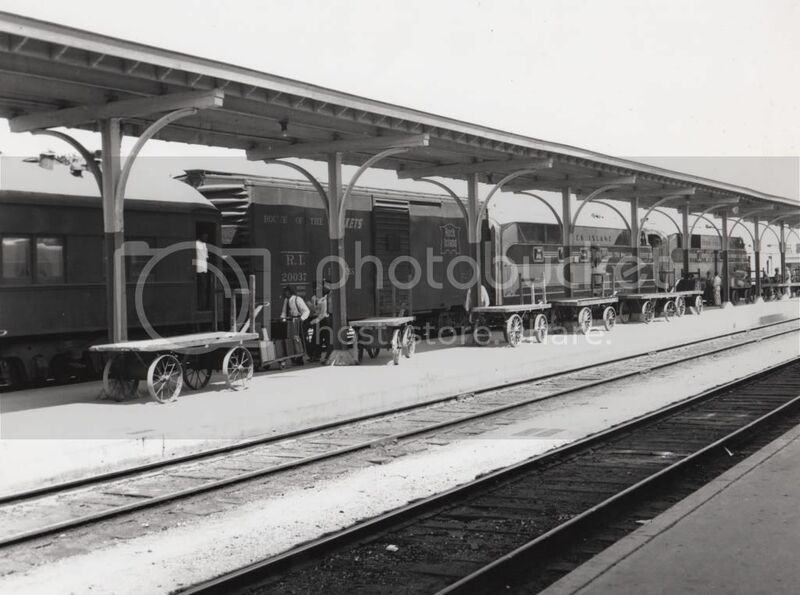 They failed to visualize just what location of tracks, passenger and freight depots through the main part of town would do, as the city did grow and street traffic increased – even in the wagon and buggy days – which after 1910 the advent of motor traffic magnified. I Want My Space! 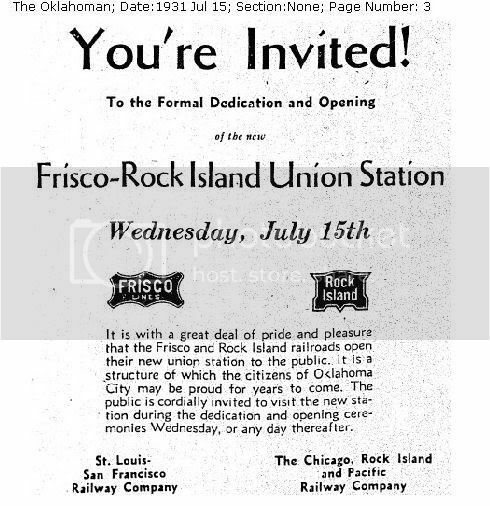 Stewart notes that, "By 1911 the Chamber of Commerce had begun a twenty year fight before the State Corporation Commission and the Interstate Commerce Commission, to force the Rock Island and Frisco to remove its downtown trackage." The years between 1911 to 1928 were fraught with administrative and court hearings, litigation, and, doubtless, a great deal of expense. 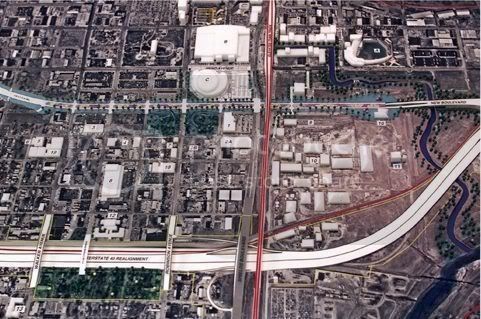 In the end, and outside of either "side" being forced to do anything, an agreement was struck that the city would purchase back it's earlier granted rights-of-way along what is now Couch Drive for the sum of $4,000,000, the tracks would be removed, civic improvements would be built in the same area, and Frisco and Rock Island would build a "common" passenger terminal, which is to say, a "Union Station." 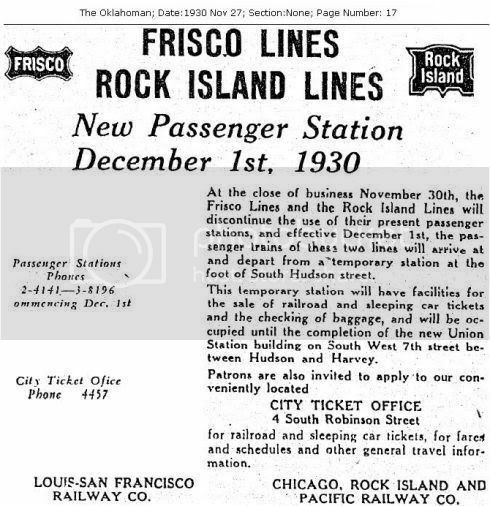 I'll expand this section later, but, for now, suffice it to quote from a February 20, 1929, Oklahoman article: " 'Twenty years of scrapping over a union station apparently was ended with the passage of the $4,000,000 bond issue which enabled the city to get the Rock Island and Frisco tracks out of the business district,' said McKenzie [Oklahoma City Municipal Counselor]. 'Everything now seems to be lovely.' 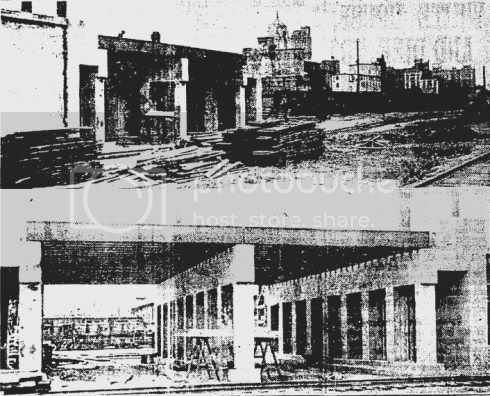 " By August 11, 1930, concrete was being poured at the S. Harvey location for the new "Union Station" facility which would become the new location for the Rock Island and Frisco lines. 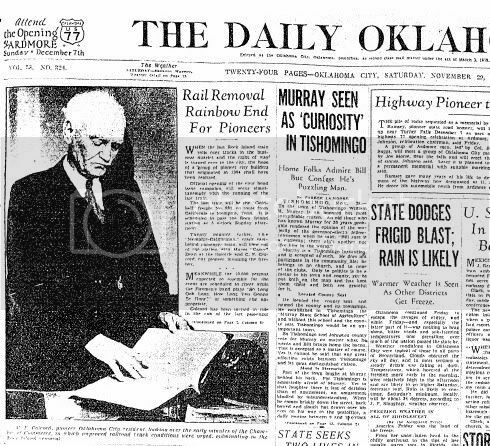 If you want to research on your own, check out articles in the following Oklahoman issues: June 30, 1924; November 17, 1924; November 22, 1924; June 30, 1925; August 18, 1925; October 20, 1925 (which gives a nice historic overview of the issues); July 12, 1927; and November 26, 1929 ... which ought to be enough to get you started! Here are a few pics leading up to that event. Note about the image below: Mr. Griffith says this pic was taken in 1925, but that can't be right. Notice the completed Montgomery Wards building at the far right (more closely seen in the 2nd image, below). Its construction dates were 1929-1930. 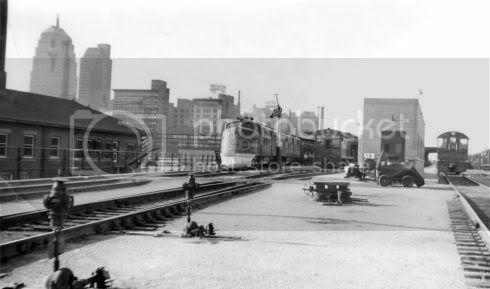 And, notice that a lot of track appears to have been removed in the former railroad right-of-way (compare the pic below with the one above) and that the 1931 1st National Bank and Ramsey Building are not yet in the skyline. 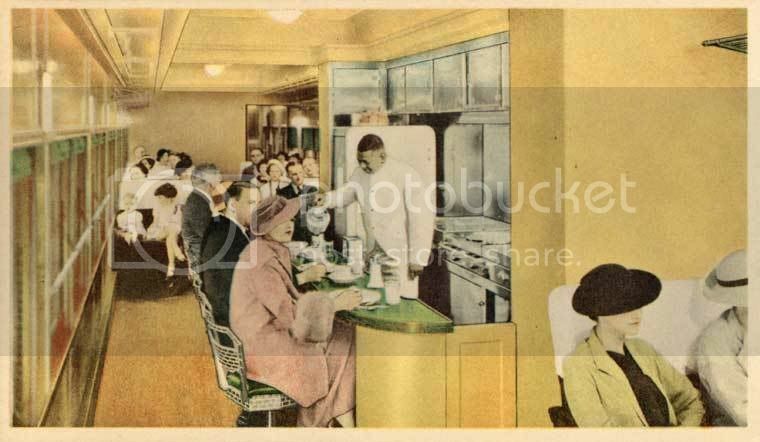 I'm dating this image as having been taken in 1930. Completing the impossible, the "pioneers of 1930" broke down the "iron wall" through Oklahoma City late Sunday to push on toward their Utopia, a model civic center. 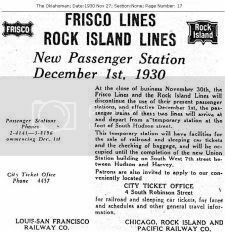 The "wall" was the aged Rock Island line of rails which as divided the city since its foundation, and the "pioneers" the young business men of the city led by a veteran, C.F. Colcord, city builder. After the blare of the ceremony had settled down and darkness enveloped the city, light blazed along the old right of way as workmen for the company lifted the tracks and others began leveling the station relic. 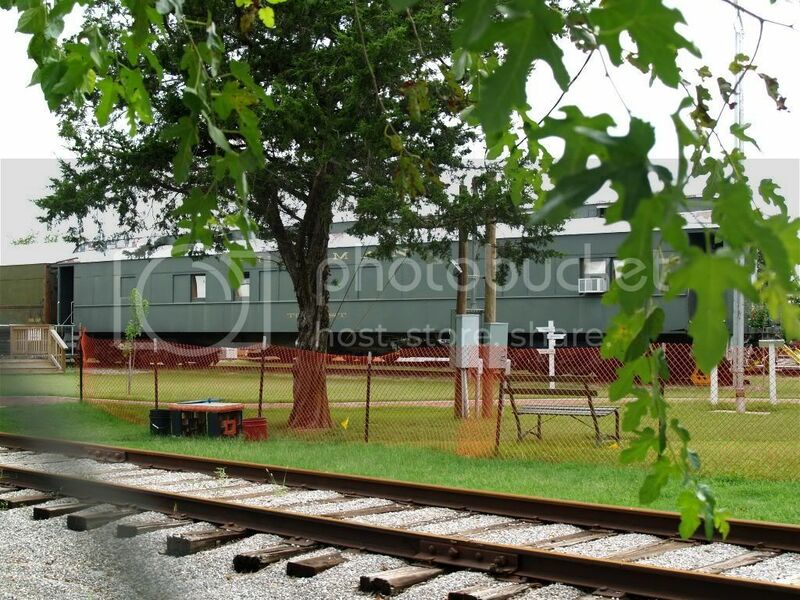 Their task is that of removing all signs of the railroad in 48 hours. 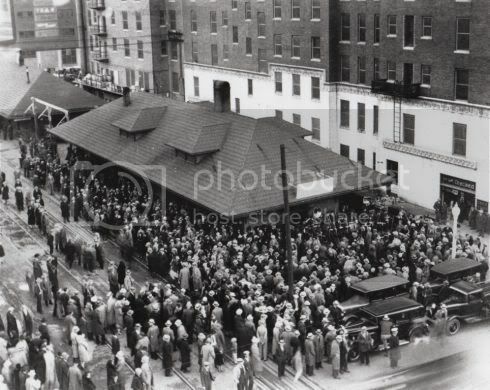 Before about 5,000 persons, all in a holiday spirit, the last passenger train over the line pulled in to the falling station and out with Walter C. Dean, mayor, at the throttle and Colcord, the guest of honor as he rode the first train into the city 41 years ago, wielding the fireman's shovel. 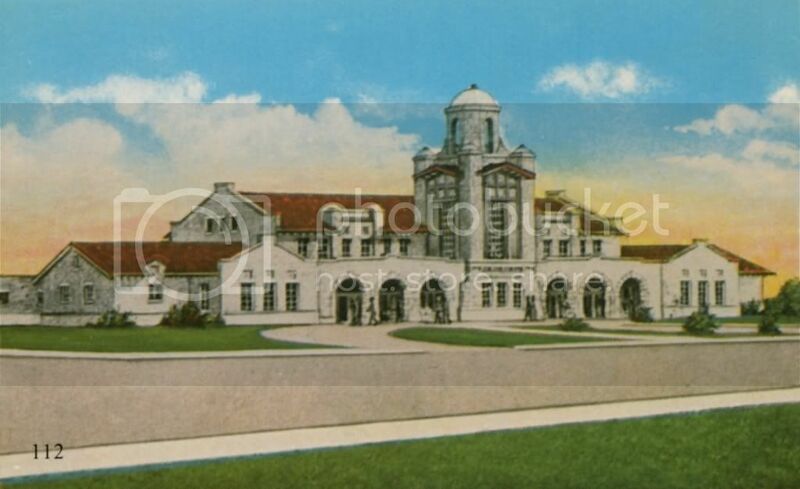 * * * As the train sped on its way, the junior chamber, Dean and Colcord broke ground for the city's civic center which is planned for the old right of way. Colcord was also the chairman of the committee which prevailed on the public to pass the $8,800,000 bond issue (there may have been 2 separte bond issues ... 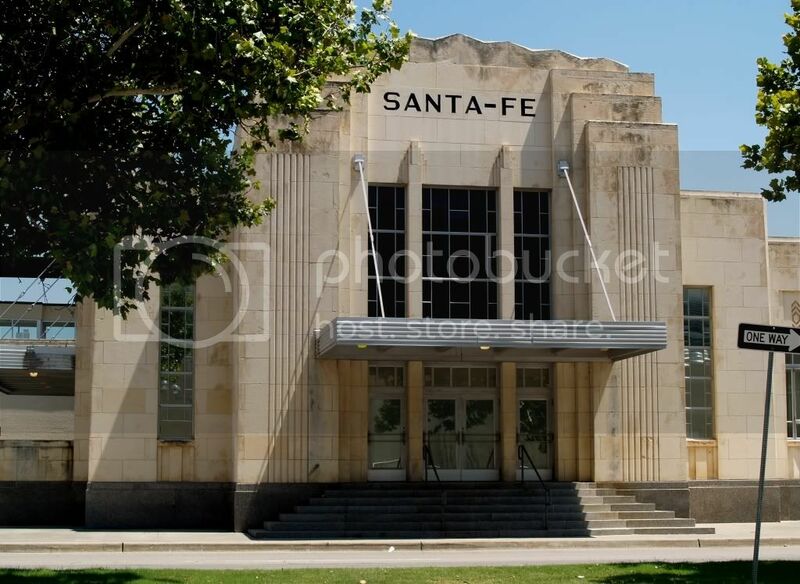 I'm checking) used to finance this and related projects including elevation of the Santa Fe, new Santa Fe Depot subsidy, and the new Civic Center (City Hall, County Courthouse, Music Hall) which would replace the old tracks. More about that later. For now, say goodbye to the Rock Island Depot just as Charles Colcord did almost sixty-seven (67) years ago! Passengers accessed the 12-track rail yard through subterranean tunnels via a gentle ramp from the grand waiting room. Mail and express were also routed under the tracks to the surface passenger platforms. Hudson and Harvey street traffic met the trains "at grade," enabling easy passenger access and seamless exchange of time-sensitive mail and express freight between trucks and trains. 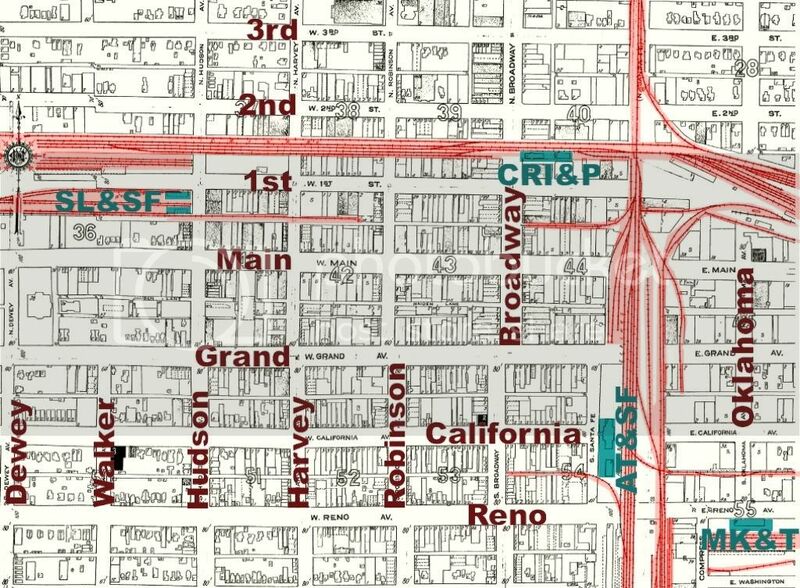 Arterial traffic on Robinson and Walker streets flowed freely under rail yard underpasses built as an integral part of the station complex. 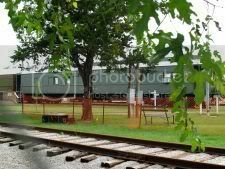 Massive freight warehouses and material handling areas were located behind the passenger facilities. See the full article for much greater detail. 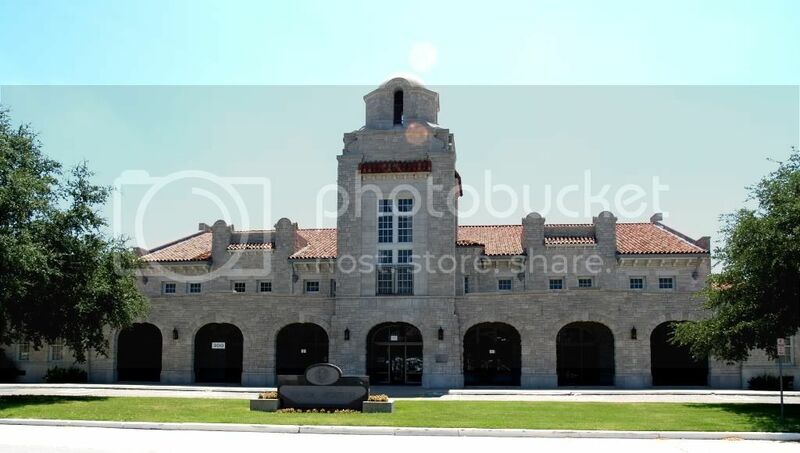 And, though I think that it's a lost cause at this point in time, see the nomoron website and Oklahoma City Rail.org for Union Station advocacy groups that think otherwise. Actual photos, inside and out, are shown below, in another section of this post. Santa Fe Station: Old Kid On The Block. 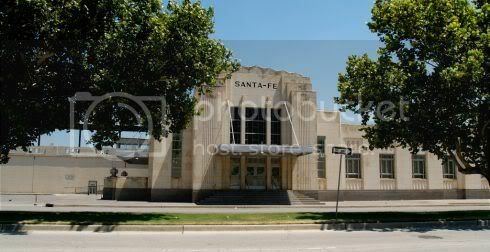 With the change, Santa Fe would also get a new station. The 1900 version was razed in 1930, the downtown tracks were elevated so that traffic could pass underneath at various locations, and, eventually, a new depot would be completed later than expected, in 1934. Leo Sanders was awarded the contract on elevation of the rails, just as they are today. On edit, I'd earlier posted 2 images which I thought had been part of the construction of the elevated rail through downtown, but on further study I see that they could not have been. The images were both dated in 1930 ... but I see from the Oklahoman's archives that Sanders did not start work on that project until 1931. Replacing the earlier "good" images are a pair which aren't as good, even if they are more accurate! 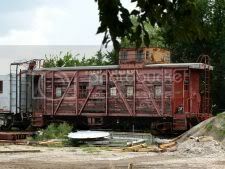 The images are from the Oklahoman as work progressed. The article reports that between Main and Reno, 6 tracks existed, which was the structure's widest point. As to the new station itself, as time went on. 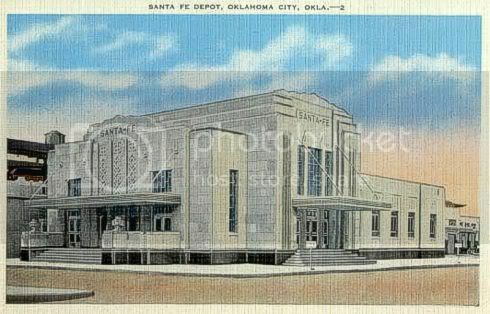 By early 1933 Santa Fe hadn't started any work on the new depot and made hints that it might not build a new depot. The City suggested that the agreed-to subsidy would not need to be paid in such event. However, this rancor, too, went away and, even though 3 to 4 years late, in 1934, the new Santa Fe opened at last. TRAINS AROUND THE TOWN. This section merely gives some typical fares and eye candy of the various trains we'd have seen during the 1930s to 1960s, more or less. With a few exceptions, they are not dated and, except as noted, are credited to Vintage Rail Pics (aka Whistle Stop Trains). Exemplar Fares/Schedules in the 1930s. 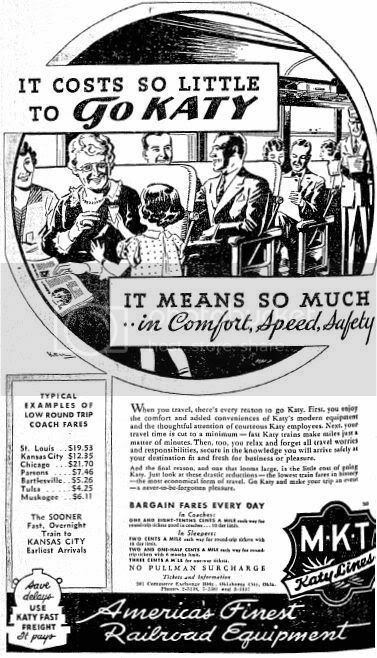 These Oklahoman ads show what it cost and some of the places you could go on passenger trains during the 1930s. Larger views are not available. 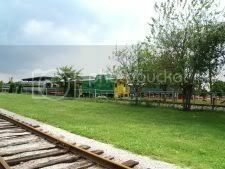 Pics of Trains & Tracks. 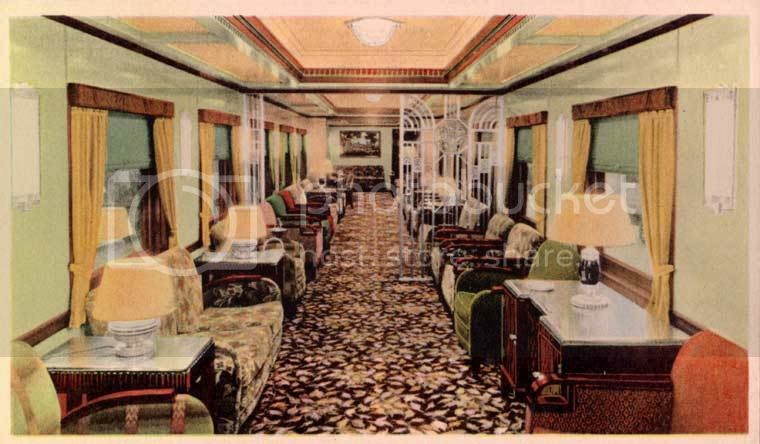 Now, for a "walkabout" of trains and places you could see way back when. Some weren't taken in Oklahoma City (as noted) but they could have been. 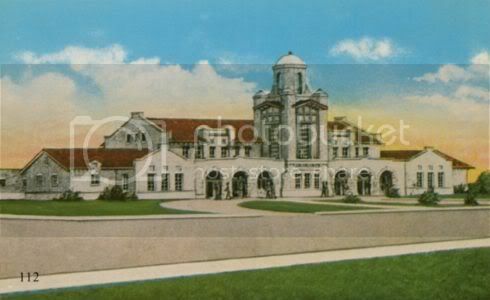 The following Frisco pics are from Springfield-Green County Library. Some are identified as being taken in Oklahoma City, and some are more generic, as noted. A Look Back At Union Station. 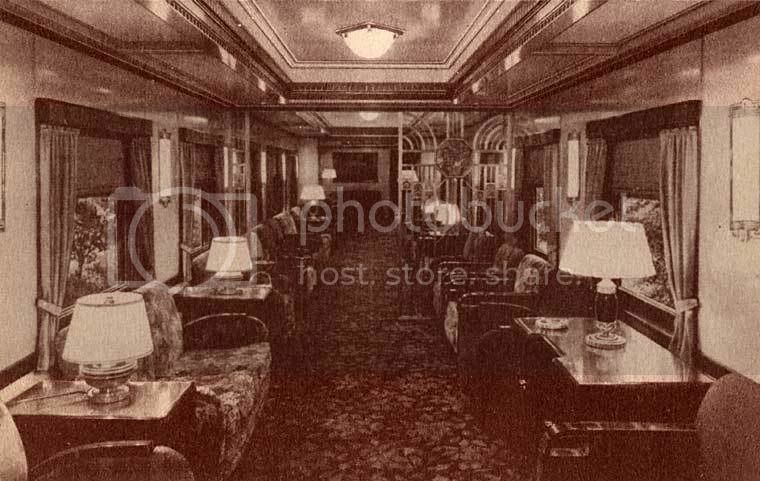 Most of these images, too, are from From Vintage Rail Pics (aka Whistle Stop Trains). Some were personally taken by Ed Birch, as noted. 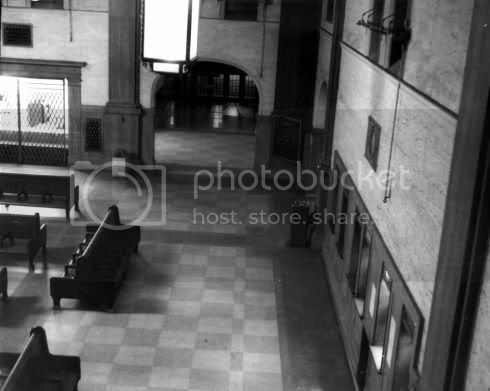 Inside Union Station Pics Taken by Ed Birch Around 1967. Ed Birch. 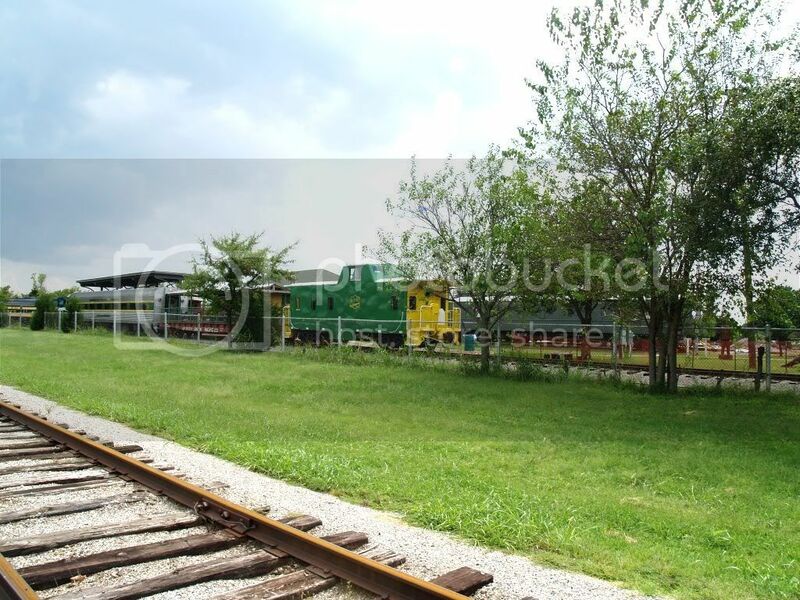 As said in Okc Trains Part 1, Ed comes from a railroad family and has been around trains all his life. He worked for Rock Island in Oklahoma City until 1980 and took these "inside" pics in 1966-1967 before the passenger terminal closed. 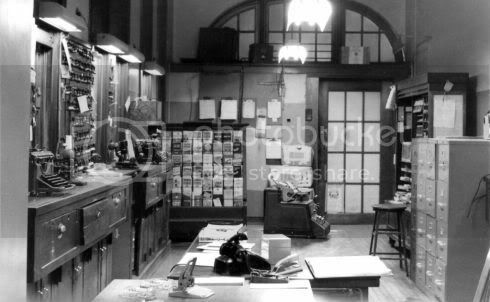 There, perhaps among other things, he was a ticket clerk in the last image shown below. Although reared in Goucester, "South Jersey," he moved to Oklahoma City by choice in 1966, he having liked it here when earlier serving on military duty. 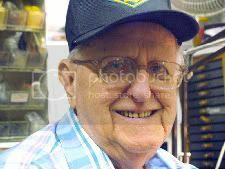 He's a delightful guy to talk with – you can meet him at Whistle Stop Trains on Britton Road. TRAINS WANE. 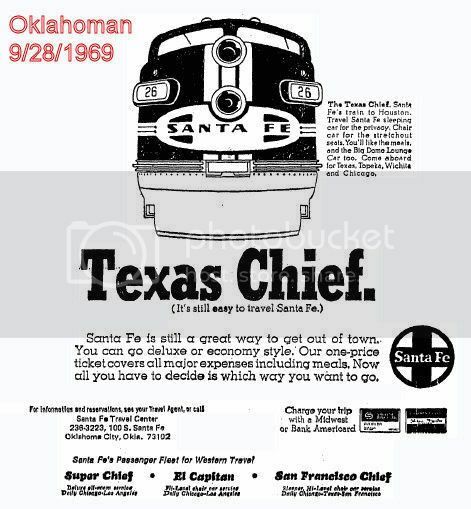 The Katy ceased its Oklahoma passenger operations by July 1965, followed by the Frisco in May 1967, followed by the Rock Island six months later, leaving the Santa Fe's Texas Chief as Oklahoma City's only surviving passenger train. 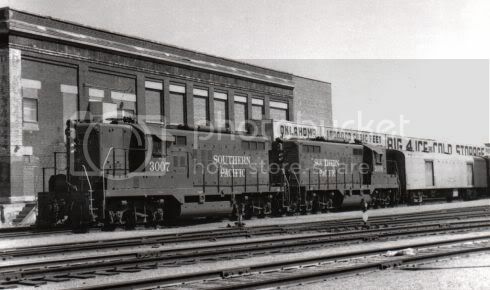 The other two were Santa Fe's "The Tulsan" between Tulsa and Kansas City and the "San Francisco Chief" which passed through Woodward and Alva on its runs between Kansas City and the San Francisco area. 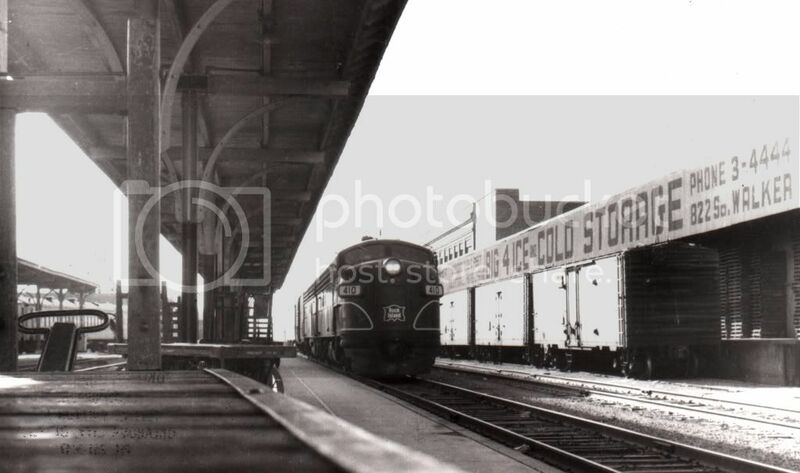 Statewide, an April 20, 1970, Oklahoman article's headline was, "Passenger Trains Fading Fast." It said, "Of 70 passenger trains that ran through Oklahoma in the golden years of railroading, only three remain. The thread that holds even these three trains on the rails stretches thin; they may disappear soon." "The city had as many as 50 passenger trains a day during the period during and just after World War II," the article says. A "50 Years Ago Today" item in the November 10, 1967, Oklahoman said, "50 Years Ago – During the year 1917 there were as many as 10 Santa Fe railroad passenger trains through Oklahoma City daily, 16 Frisco, 10 Rock Island, eight Katy and four Fort Smith & Western." For further reading, see the March 10, 1968, Oklahoman, page 19, "Train Whistle Ever More Lonely", and the May 9, 1965, article, "Trains Don't Stop Any More." 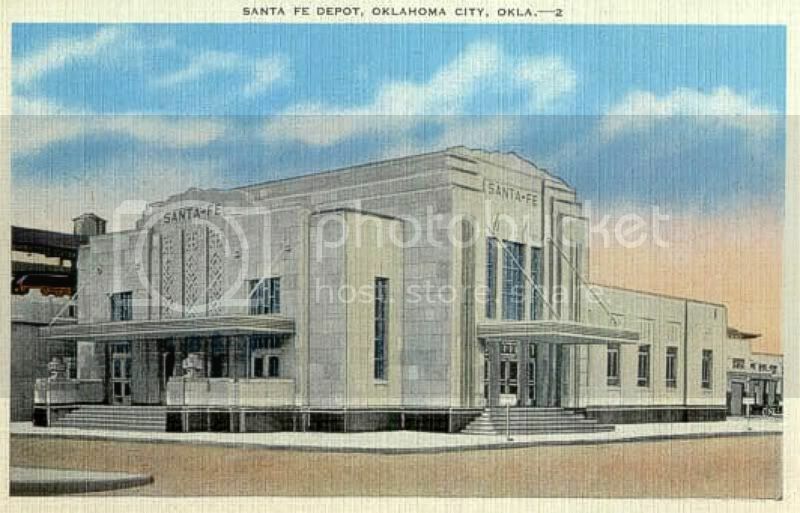 Santa Fe's run in Oklahoma City as a passenger carrier ended at the end of April 1971, even though the route was continued on May 1, 1971, as part of the US government's new "Railpax" system. 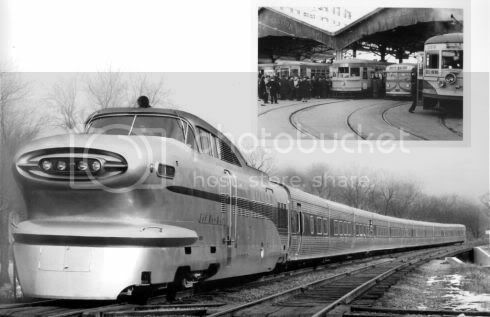 Any participating railroad was freed of the obligation to operate intercity passenger service after May 1, 1971, except for those services chosen by the Department of Transportation as part of a "basic system" of service and paid for by NRPC using its federal funds. 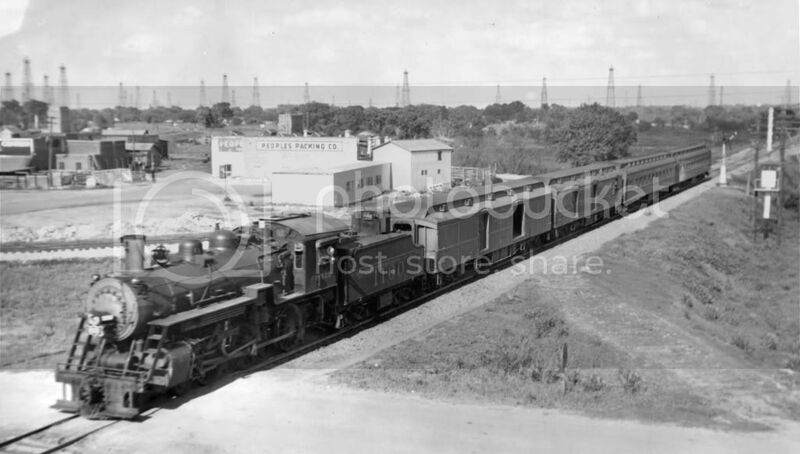 Railroads that chose not to join the NRPC system were required to continue operating their existing passenger service until 1975 and thenceforth had to pursue the customary Interstate Commerce Commission (ICC) approval process for any discontinuance or alteration to the service. 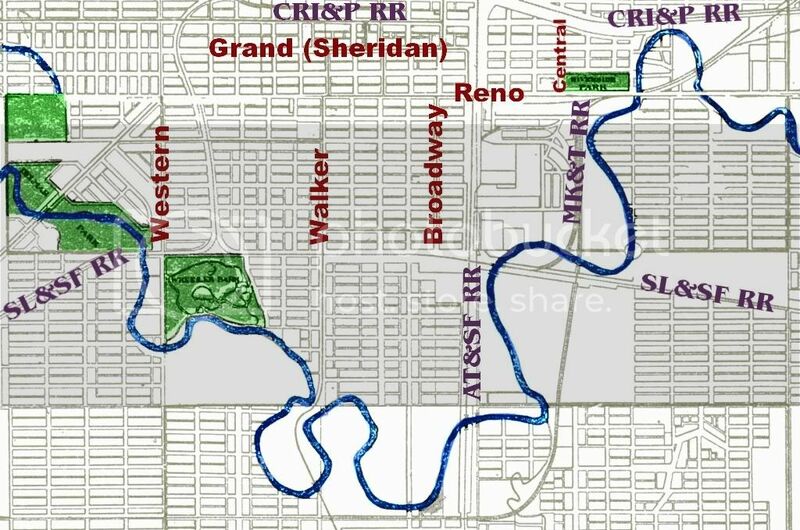 The NRPC was and is a quasi-public organization with 100% of preferred stock owned by the United States. 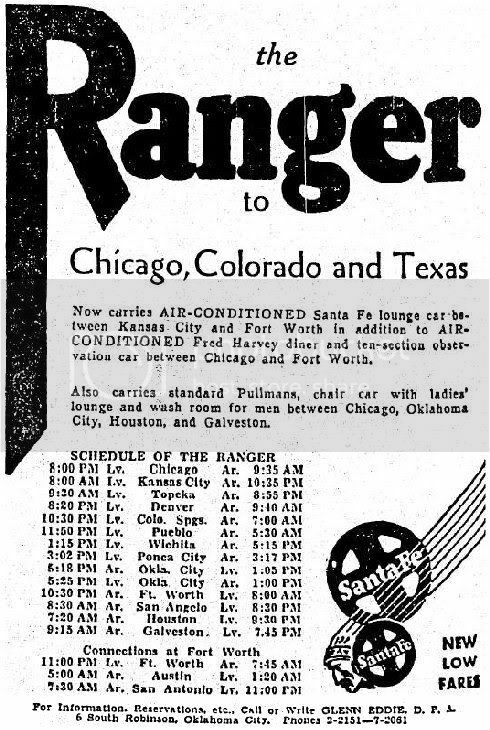 An April 20, 1971, Oklahoman article reported that the Santa Fe Railway had joined the federally backed National Railroad Passenger Corporation (then known as Railpax, later renamed Amtrak). 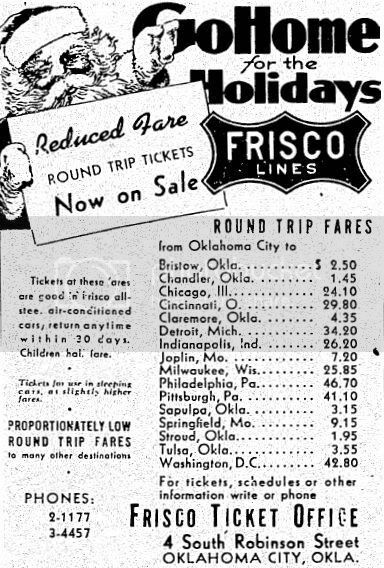 By doing so, Tulsa lost its route to Kansas City since that route was not on the Railpax list, but the Texas Chief route between Chicago and Houston (with stops at Kansas City, Ponca City, Perry, Oklahoma City, Norman, Purcell and Ardmore) remained open as Oklahoma's last passenger rail service. 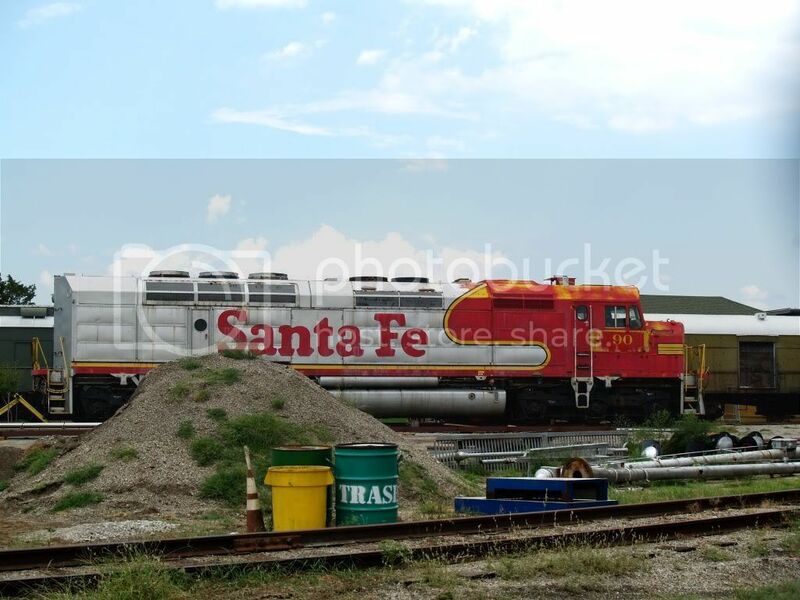 Santa Fe Railroad initially allowed that Railpax use the former "name" of "Texas Chief" but, opining that Railpax wasn't living up to Santa Fe standards, withdrew that permission in 1974 and the route was renamed as the "Lone Star." 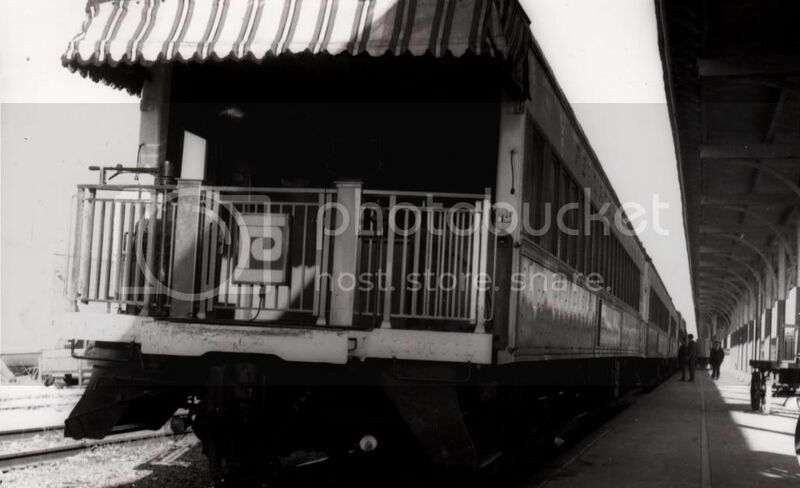 The first "Amtrak" train pulled into Oklahoma City on May 1, 1971, "right on the dot" according to a May 2, 1971, Oklahoman article. 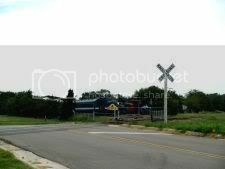 With the advent of Amtrak service, stops were no longer made at Newkirk, Guthrie, Pauls Valley or Marietta, although stops in Ponca City, Perry, Norman, Purcell and Ardmore, as well as in Oklahoma City. 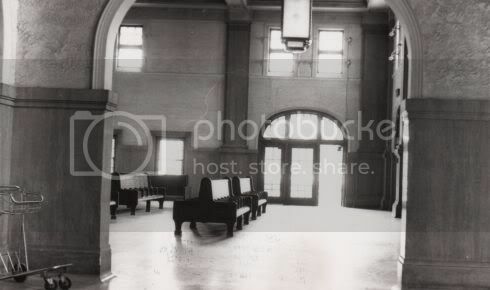 The article said that, "Under Amtrak, it will stop at Union Station to make better connections with other Amtrak trains," but that makes no present sense to me since no other passenger service existed in Oklahoma City at the time. Maybe that was a mistake in the article, I don't know. 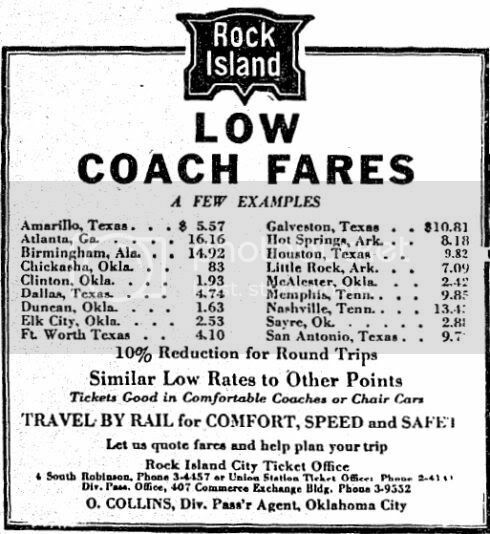 In any event, Federal spending cutbacks were in full swing in the late 1970s and the Lone Star route was reportedly one of Amtrak's biggest money losers, according to a July 29, 1979, Oklahoman article. 1977 federal legislation mandated that the National Railroad Corporation (Amtrak) make adjustments to in its routes and to "live within its means," according to a November 6, 1977, Oklahoman article. But, by as late as an August 22, 1979, Oklahoman article, Amtrak had not decided whether to keep the route. 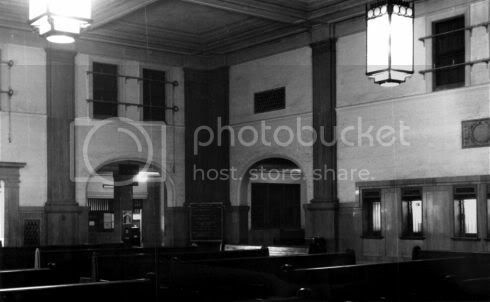 But, on October 1, 1979, Amtrak's only Oklahoma route made its last "scheduled" run, even though it remained operational for a few more days due to pending litigation in US District Court in Wichita, according to an October 2, 1979, Oklahoman article. 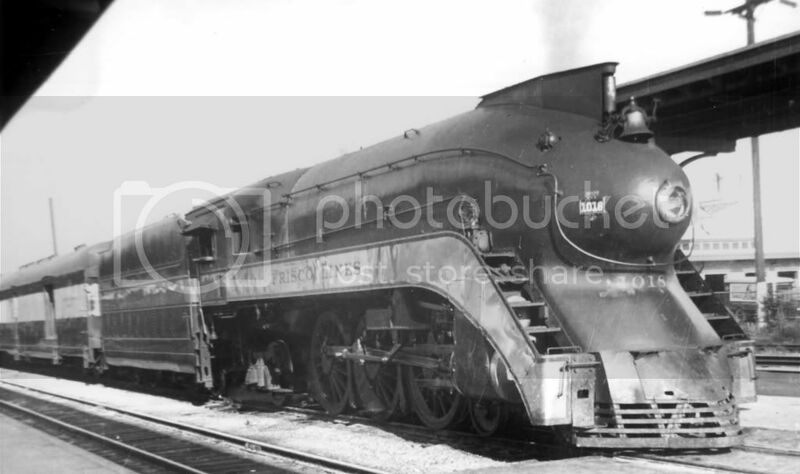 But, close down, it did and thereby making Oklahoma the largest of the four 48 contiguous states (Oklahoma, South Dakota, Maine and New Hampshire) not to have Amtrak service. 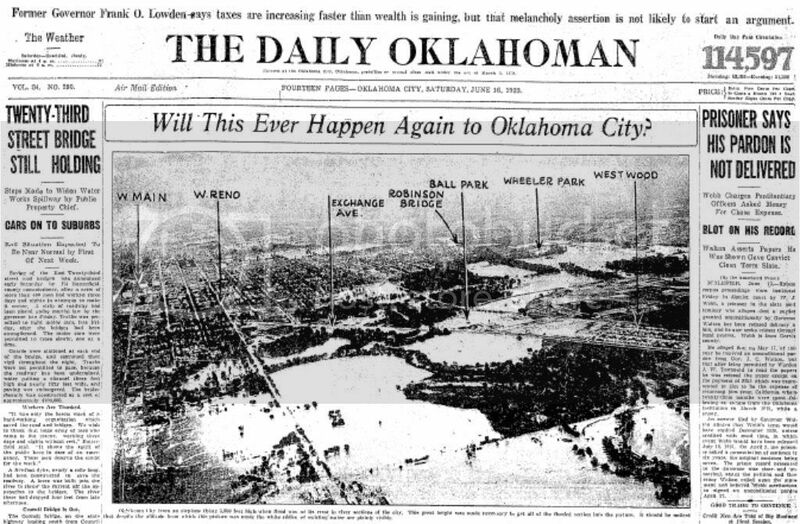 The image below from a December 21, 1980, Oklahoman article gives the picture which would remain true for Oklahoma for two decades to come. TWENTY YEARS WITHOUT A TRAIN. 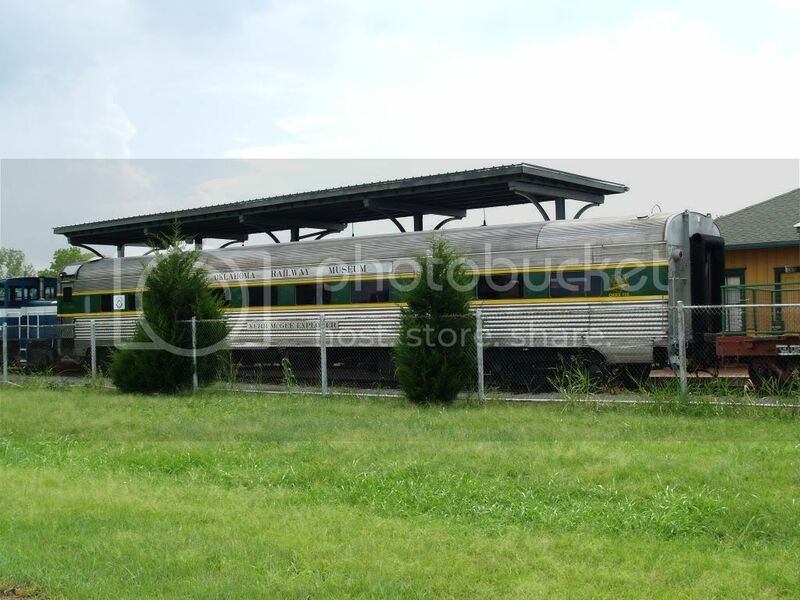 Did Oklahoma really care about the loss of passenger rail service? 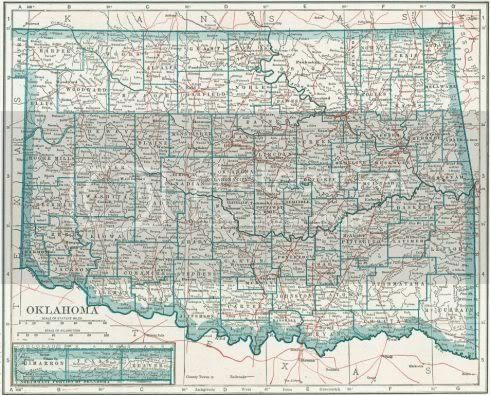 During the 20 years between 1979 and 1999 Oklahoma gave mixed signals. An 1980 initiative petition to overturn Oklahoma Attorney General's Jan Eric Cartright's legal opinion (that under the state Constitution money could not be given to a privately owned company, even though Amtrak was not a "for-profit" organization) to help subsidize such operations failed in a November 1980 statewide referendum – if passed, the referendum would have authorized the Legislature to raise taxes – the vote was a resounding, "NO," 670,899 to 279,355. The vote was disheartening not only to the chagrin of Oklahoma rail enthusiasts but to those in Kansas and Missouri, as well, the article notes. 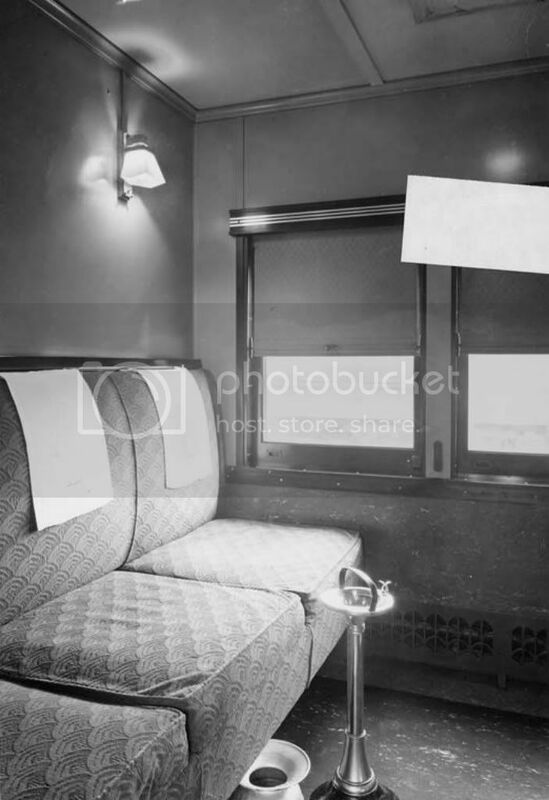 The idea had been to reopen a route between Chicago, St. Louis, Springfield, Tulsa, Oklahoma City, and Houston. 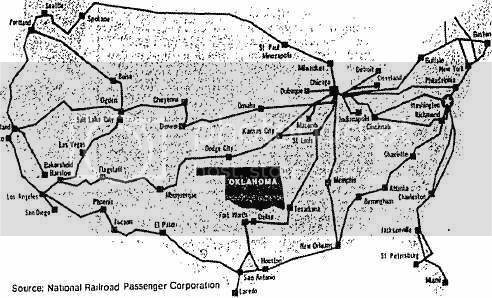 The December 21, 1980, Oklahoman article reported that even Amtrak had "lined up behind Oklahoma by appropriating its anticipated subsidy share and that Oklahoma was the only state to receive such an appropriation before officially requesting it." The US congressional delegation hadn't been of the same mind, either, with Sen. Henry Bellmon and Reps. Mike Synar and Jim Jones having earlier voted against a "freeze" that would have kept the Lone Star route open beyond its October 1, 1979, shutdown, a position apparently taken due to federal budget balancing perspectives, and notwithstanding the viewpoints of Reps. Glenn English and Mickey Edwards and Sen. David Boren. 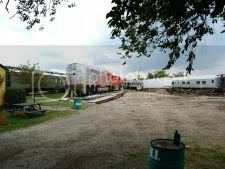 Numerous ventures and adventures occurred in the two decades following which might have led to at least some renewed passenger rail service in Oklahoma. 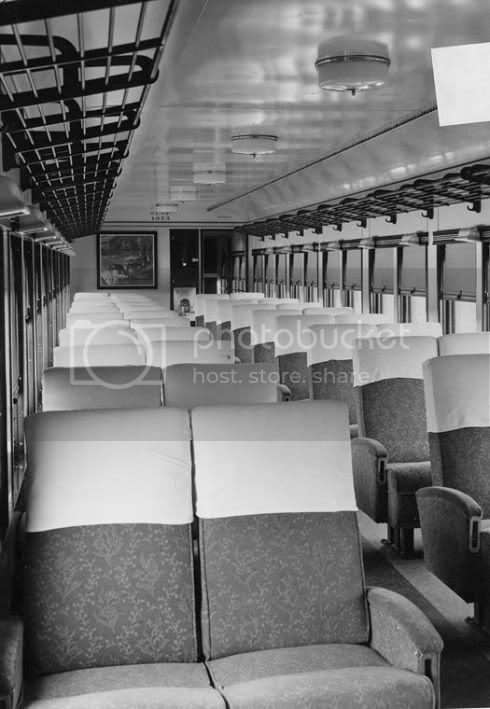 In December 1979, in response to a request by the Oklahoma City Chamber of Commerce and supported by the Wichita Chamber, Amtrak agreed to perform a "feasability study" for a "demonstration train" for proposed service between Oklahoma City and Newton, Kansas. 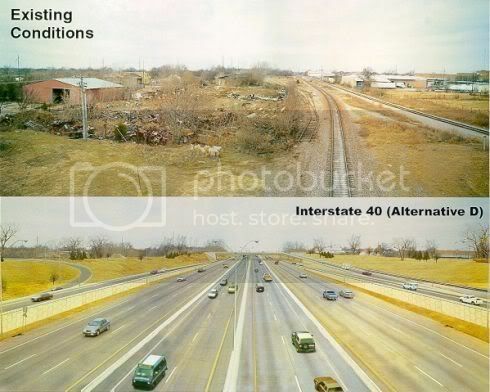 A November 25, 1979, Oklahoman article reported that, under the Amtrak Reorganization Act of 1979, that "demonstration routes" could be established between two major metropolitan areas that are not more than 200 miles apart. 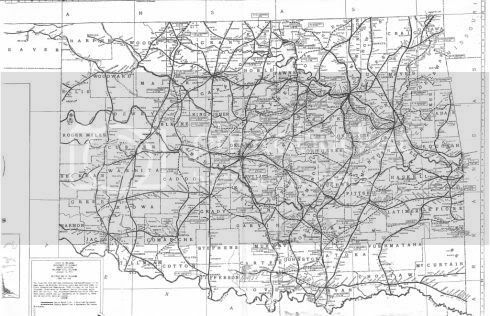 While the route between Oklahoma City and Newton was 199 miles, and while Newton, itself, did not qualify as such a metropolitan area, Wichita (which the route would pass through) did. Nothing came of that, however. By 1989, then Gov. Bellmon hadn't changed his mind from his US Senator days. A September 6, 1989, Oklahoman reports him as saying that, "[We] have a lot better uses for our money" and that there is "no point in continuing to run them for nostalgic reasons." 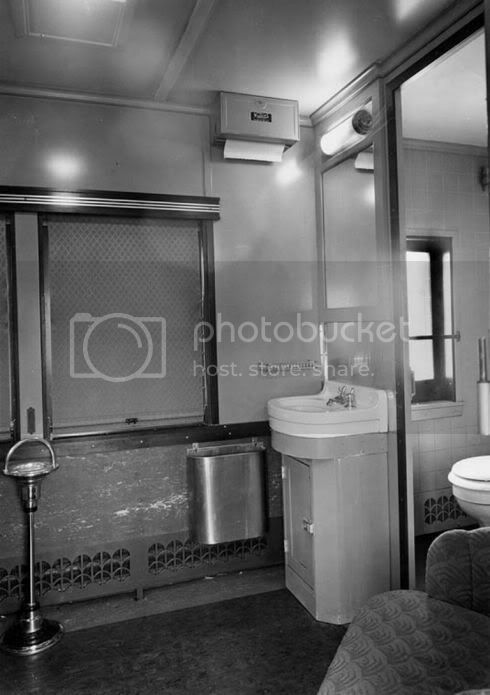 There's a lot more about Amtrak in Trains Part 3 and Trains Part 3A. 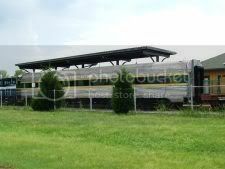 The Heartland Flyer has a fine website at www.heartlandflyer.com ... click that link or the image below to get there. 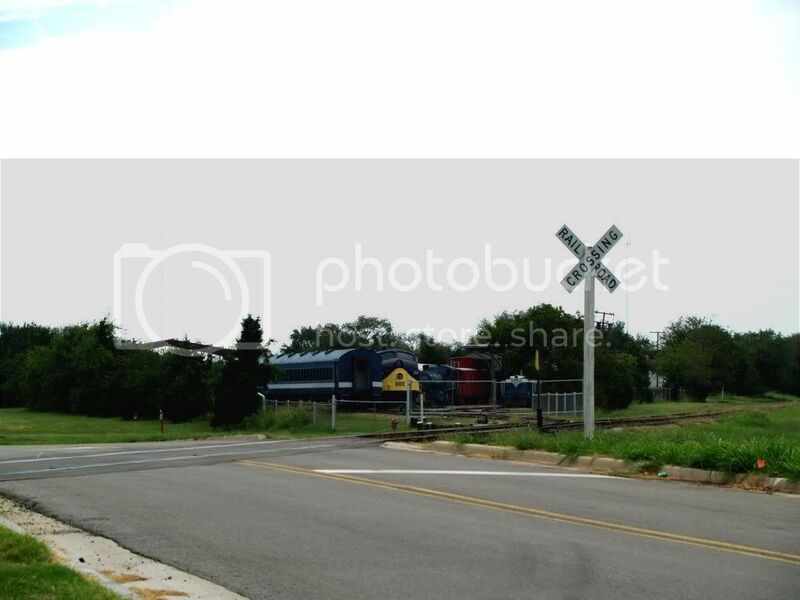 By the way, on the Oklahoma side, the train clips along at 79 m.p.h., but it slows to 59 m.p.h. when it hits the Texas border. That's because Oklahoma has spent some bucks upgrading the line for safety standards permitting the higher speeds but Texas has not. See Heartland Flyer's Q & A web page. As for most if not all of the rail behind it (most has already been removed), it is set to be the location of the new I-40 Crosstown on which construction is well under way ... even though there's a lot left yet to do. A couple of Oklahoma Department of Transportation's images of what the road will look like are shown below (larger images not available). Santa Fe Today. 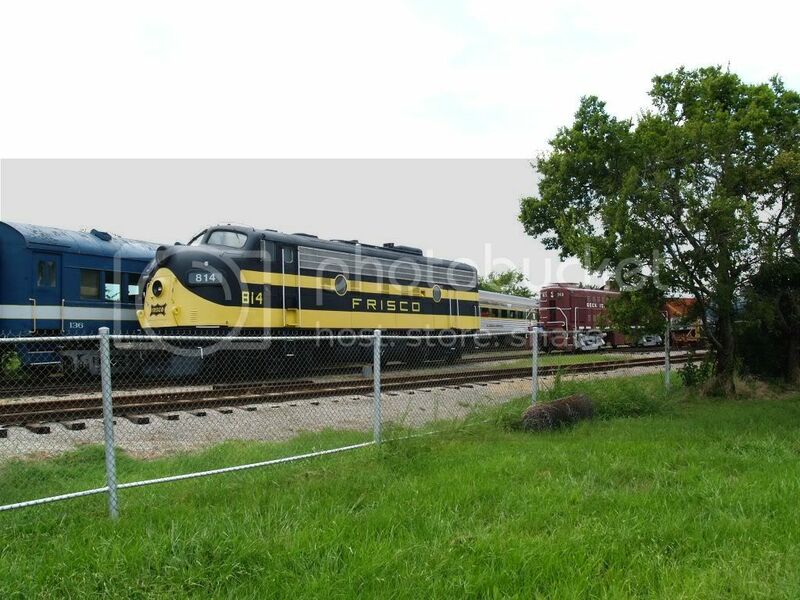 Today, Jim Brewer owns this facility and its future is in his hands ... even though it is open as the Amtrak servicer early when the Amtrak heads south for Ft. Worth and in the evening when it returns. 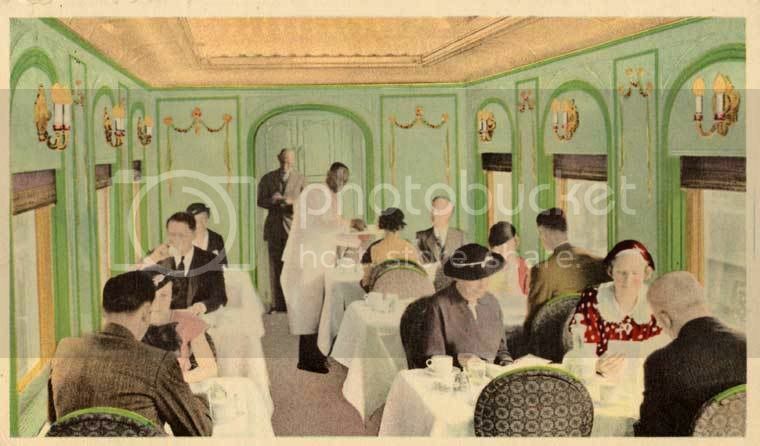 I'll get some inside pics when I can to see if restoration of its original art deco premises are up to the mark. Oklahoma City to Tulsa and/or KansasCity or St. Louis. 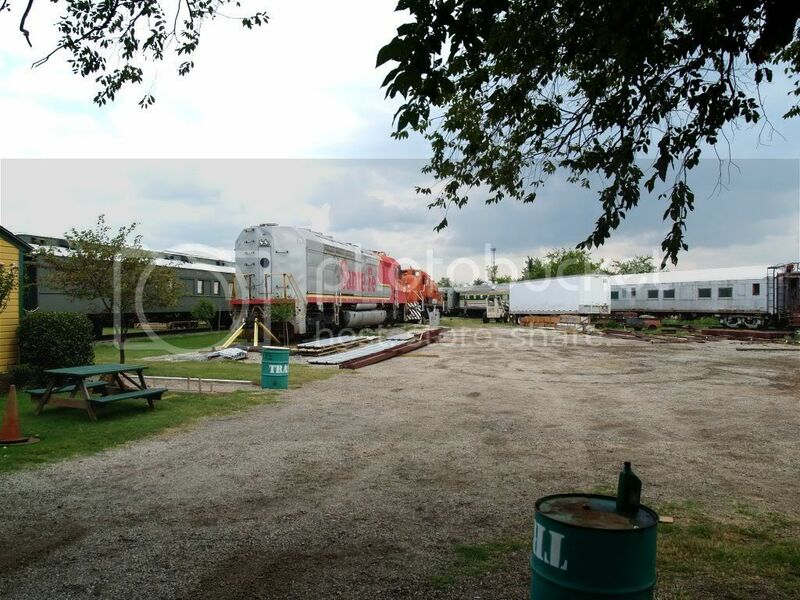 Of course, there's nothing new about talk of an Okc/Tulsa and/or points beyond Amtrak line. Aside from the cost factor of upgrading existing lines, even if the money were spent would the route be used if it would take 2-3 times longer to get there than it does a 1 1/2 hour trip up the turnpike? 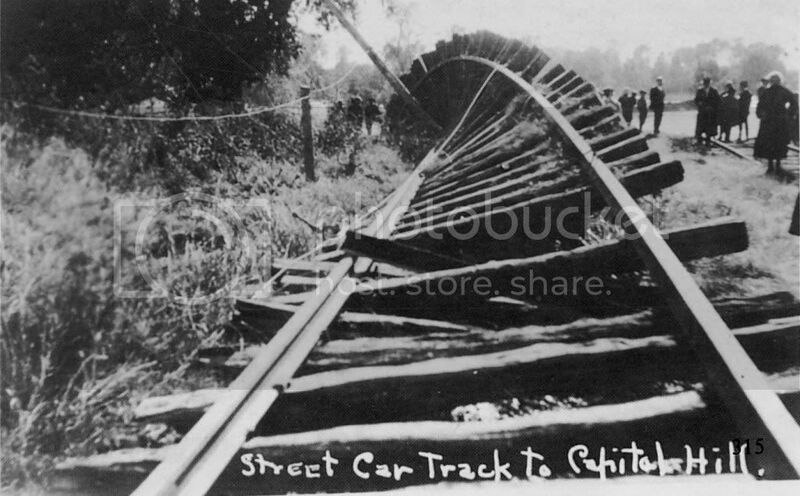 To be really high-speed, a new rail line straightening out lots of curves would likely be needed. Still, the item is high on Oklahoma agendas. See this December 11, 2006, Journal Record article in which an Amtrak representative urged that studies be performed. The article provides a comprehensive list of problems and promise. Another article to read is in the April 16, 2007, Journal Record, discussing the legislative agendas of both Oklahoma City and Tulsa. There are many more. Just Google "Amtrak Tulsa" and you will find plenty. 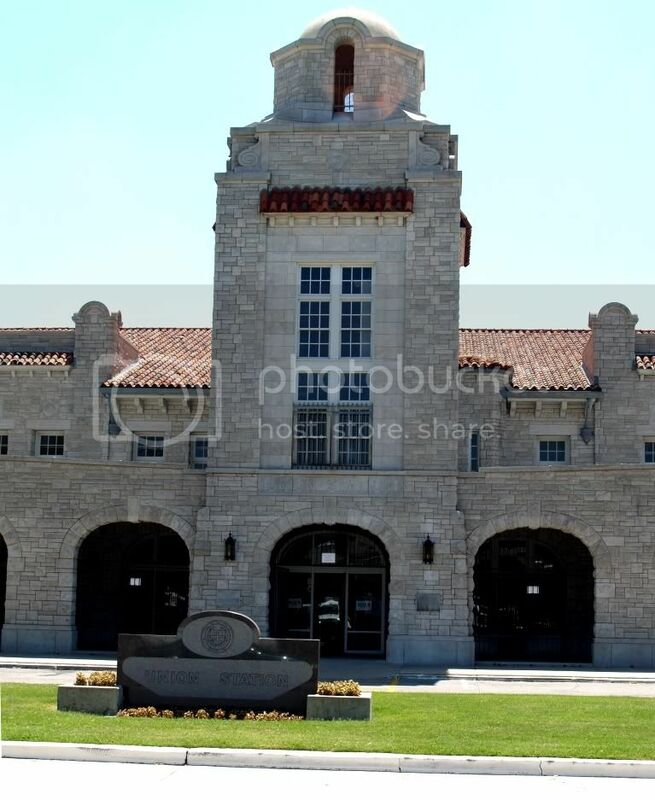 WICHITA (AP) — A group wants to bring Amtrak back to the state's largest city, which hasn't had passenger service since 1979. The Northern Flyer Alliance wants to speed up expansion of the Heartland Flyer route north from Oklahoma City to Wichita, Newton and Kansas City, Mo. "I haven’t found one person yet who says that's a crazy idea," said Autumn Heithaus, the alliance's executive director. Anyone wanting to catch an Amtrak train from the Wichita area must drive 20 miles north to Newton, and there is no service running south. That doesn’t sit well with 81-year-old Rosemary Terry, a member of the newly formed Northern Flyer Alliance. She would like to visit her daughter in Fort Worth, Texas, which is served by the Heartland Flyer route. The expansion move also is getting support from Evan Stair of Norman, Okla., director of the Amtrak Extension Coalition. 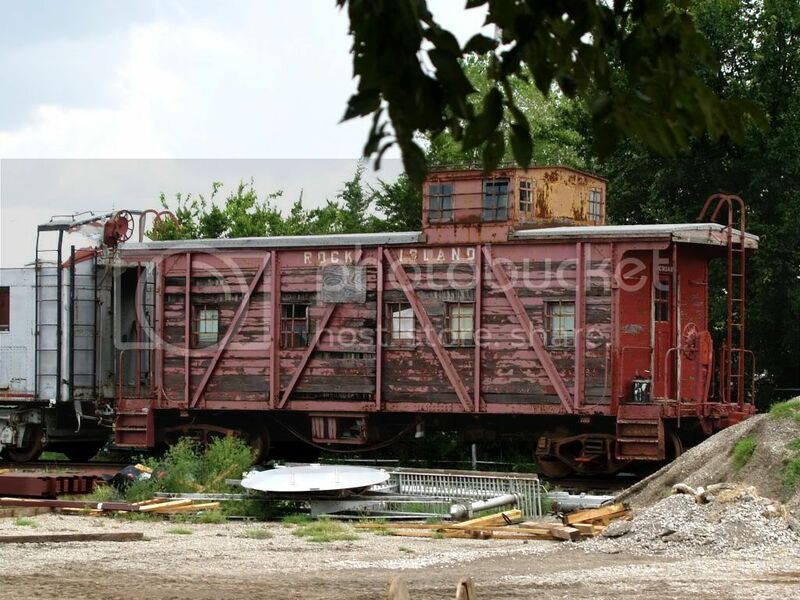 "This train should've operated through Wichita from day one," he said. Oklahoma transportation officials, too, would like to see the route extended into Kansas. "It only stands to reason if it were connected to the north, the ridership would obviously be enhanced," said Joe Kyle, manager of the rail programs division for the Oklahoma Department of Transportation. To that I would add, "for what it's worth." It's a nice idea, though. 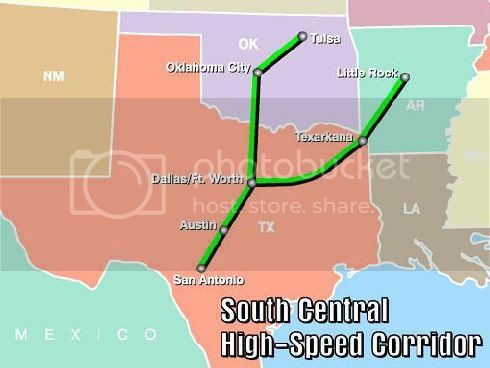 South Central High Speed Corridor. I found the item below at the Federal Department of Transportation website. This idea/plan/concept/whatever-it-is has been "on the drawing board" in some way since 2004, but I'm clueless about what significance, if any, it has. If you're curious, poke around here and if you find something useful, there you are! Another thing: During Oklahoma's Centennial year (that's this year if you've not been paying attention), Amtrak's Heartland Flyer is running a cool special ... pay for one adult ticket, get one free. Go to the Heartland Flyer website and scroll to the bottom of the page for more information. I've taken this trip with a group of friends about two years ago -- we rented some neat rooms at a very nice Bed And Breakfast a little south of downtown called The Texas White House (they also chauffeured us around when needed and their meals and accommodations were outstanding) and we had a great time enjoying beautiful downtown Ft. Worth (which it really is, by the way), among other things. I heartily recommend the trip especially with a group of friends! The food's not great (prepared sandwiches, mainly) but they do have a bar -- not a great bar, but it's a bar. 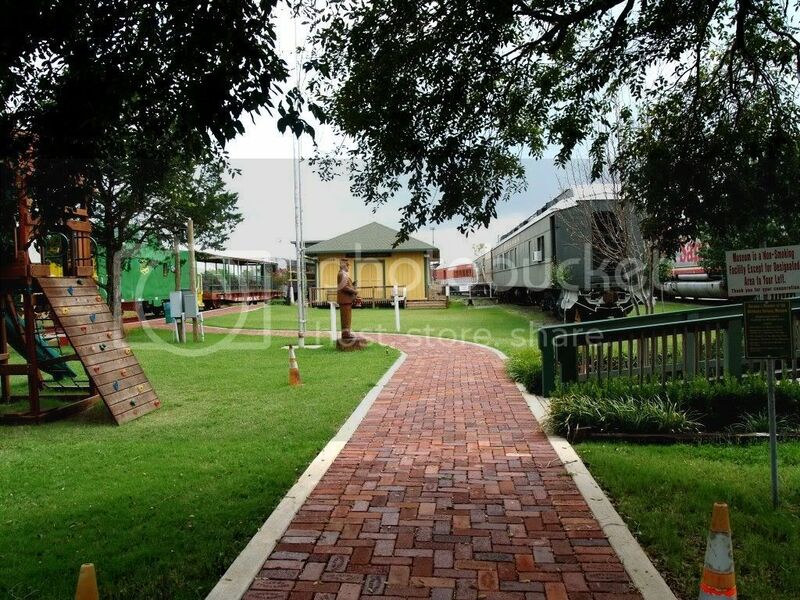 The museum is only open on Saturdays and it offers real and narrated train rides on occasion. See its website for more information. 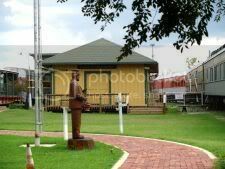 Here's a walk around the pastoral perimeter on August 29, 2007. Click on a small image for a larger view. Enter the Area From ML King Blvd. And there you have it! Okc Trains Part 2 is done ... but ... click on a link below for additional posts in this "Okc Trains & Trolleys" series ... it turned out to be a much larger project than I thought it would be, in no small part due to the contributions of Dean Schirf, they mainly being in Trains 3 and Trains 3A. You don't know how great these posts are for me. 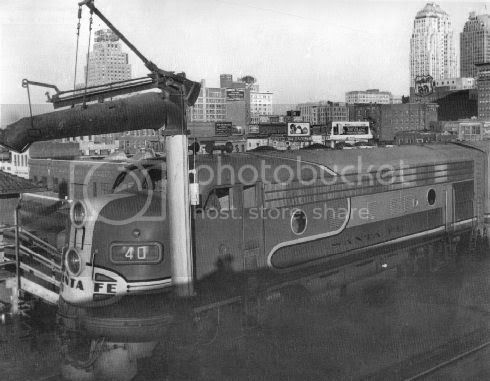 If had not noticed from my flickr page, I have a bit of an interest in trains and railroading. Especially railroads in Oklahoma. Thanks again for a wonderful set of posts! most people do not know of this spot. 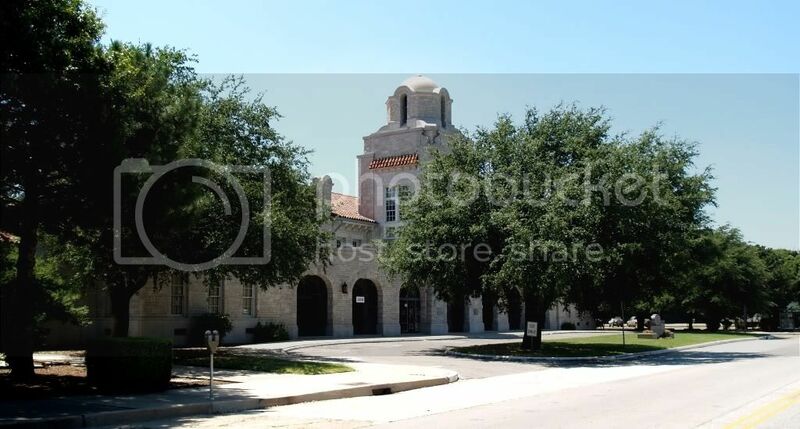 there would be more interest if ther were a place to find connections to hou galveston or most of our vacation places we visit. a trip with grandkids on a train to houston or san antonio would be great,but who has this info hidden from us. Thanks for your comments, mholmes940! A couple of links might help: ... to see or use an Amtrak interactive page showing routes around the country ... click here ... or if you want, try the Cyberspace World Railroad page links that follow: the Texas Eagle (Ft. Worth to San Antonio, among other places); from San Antonio, connections to Houston are available on the Sunset Limited route. Amtrak does not appear to connect to Galveston. Jason, thanks for your comments, always welcomed! Doug - I am curious about the photo of the construction of teh raised rail tracks that are enter into teh Santa Fe Depot downtown OKC (http://i8.photobucket.com/albums/a49/DougLoudenback/trains/santafeelevation_4_29_32.jpg). The photo description appears to suggest that S. 3rd Street had an underpass. This area is currently closed off. 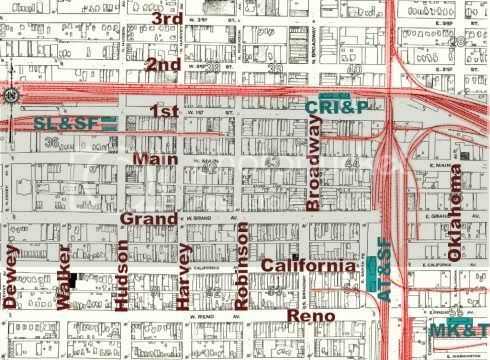 Any indication it was closed off when teh original I-40 was constructed, as 3rd Street would have been blocked by the piers that supported teh elevated highway?